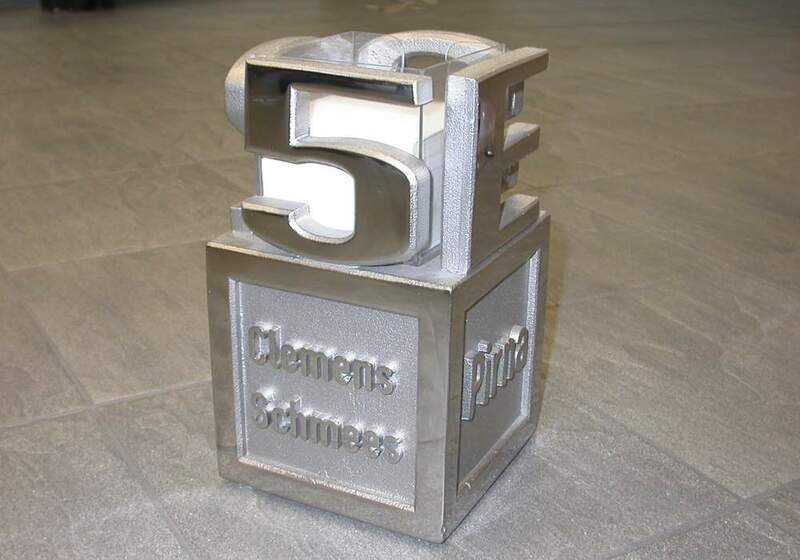 If you are looking for something special, a perfect decoration for your home, apartment or garden, as an extravagant gift for a special occasion or as a lasting memory of an exceptional person, SCHMEES offers exclusive design ideas. 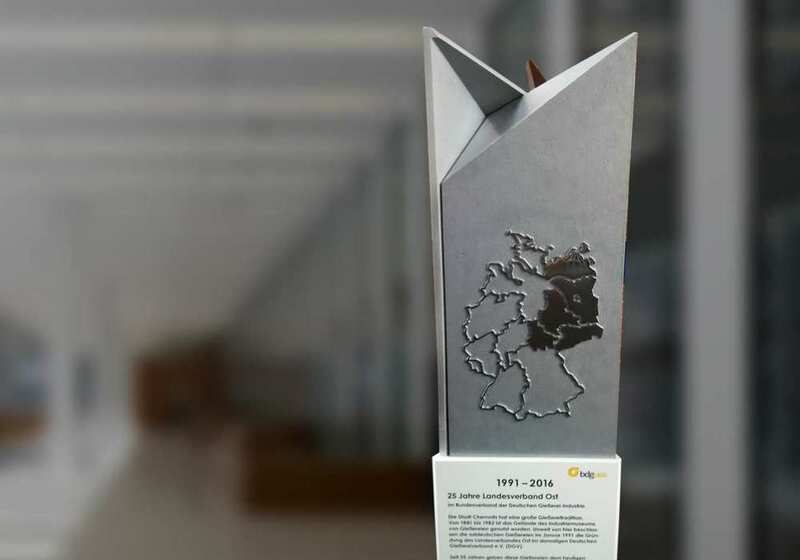 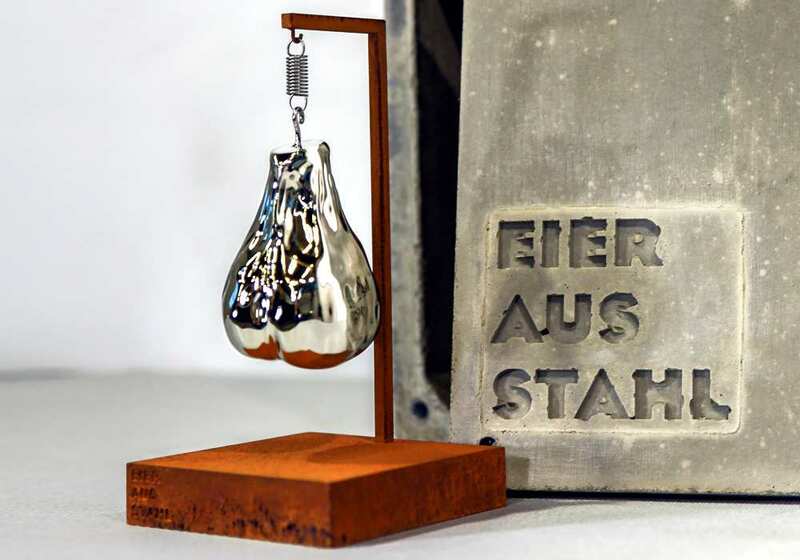 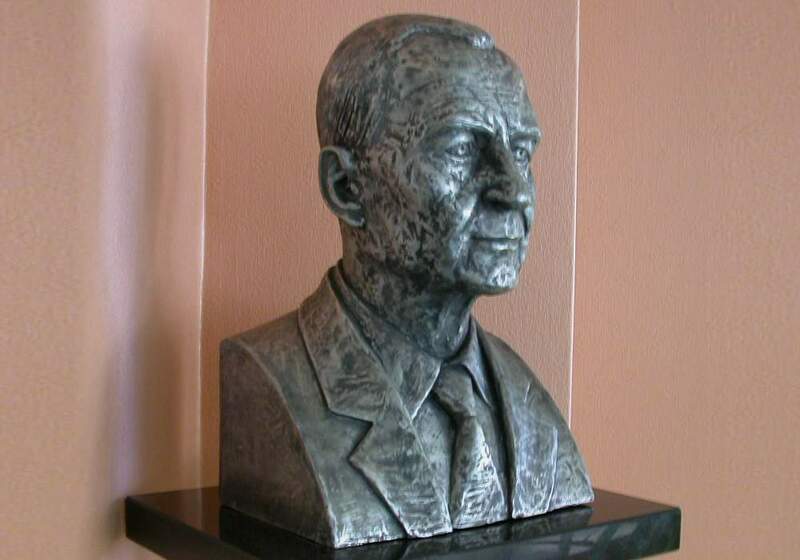 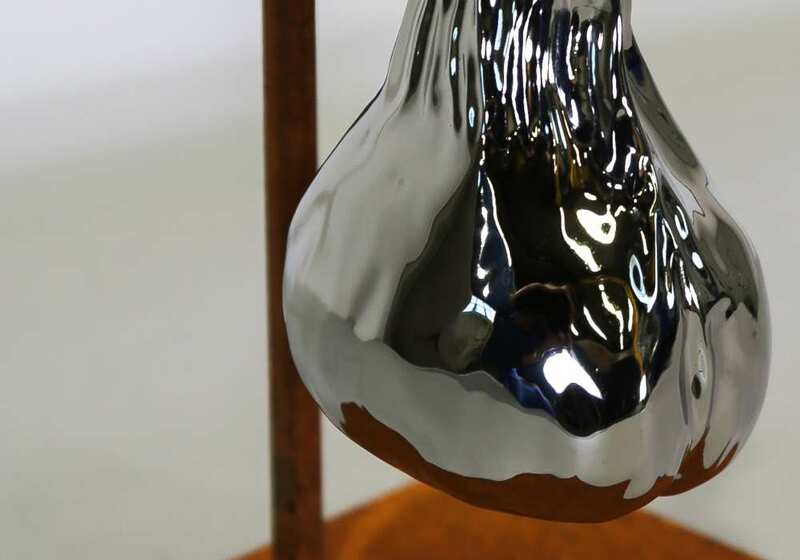 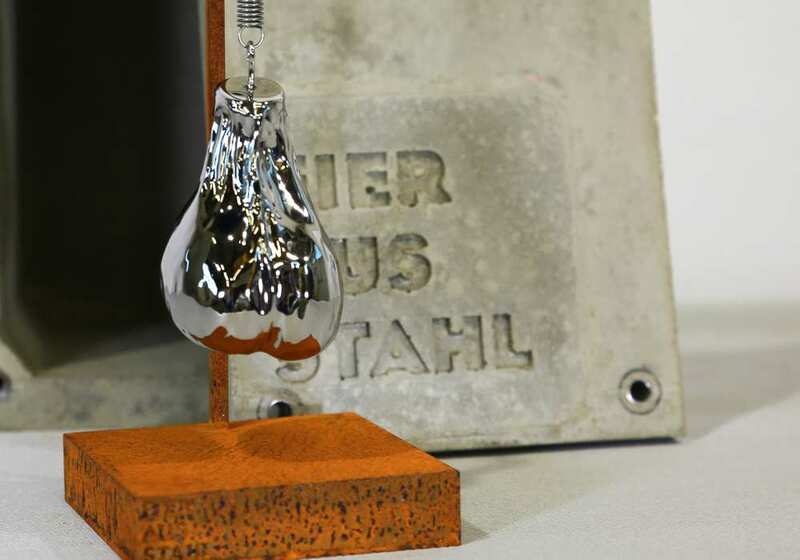 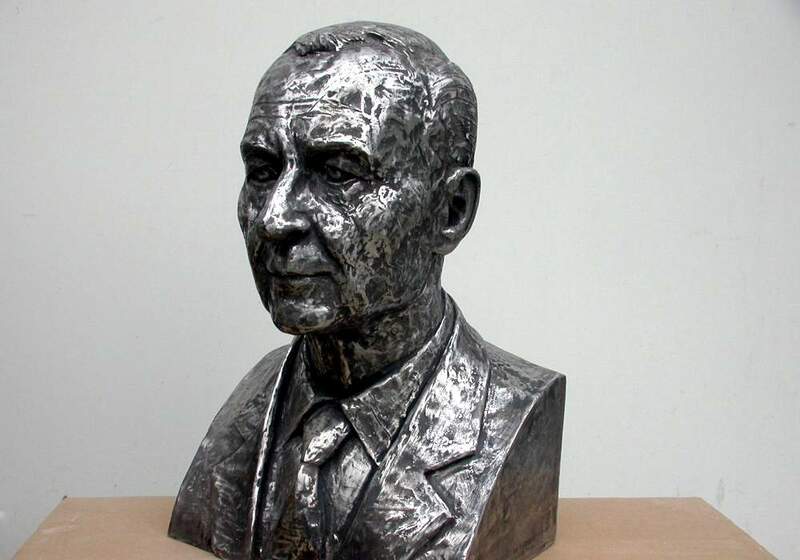 On the occasion of the 70th birthday of the founder of the company Dieter Schmees, his staff took the opportunity to cast a bust in stainless steel. 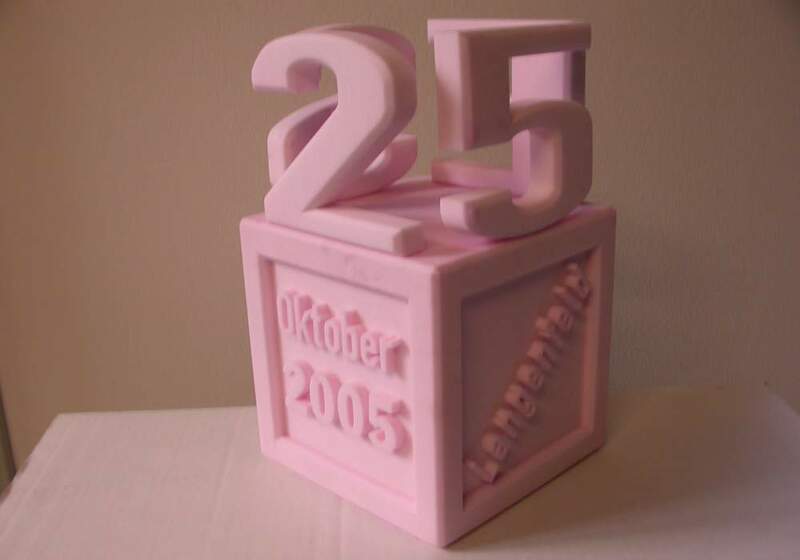 As a pattern for the wax model, the artist Şerban Ruszu had only 3 photographs, since the gift was planned as a surprise. 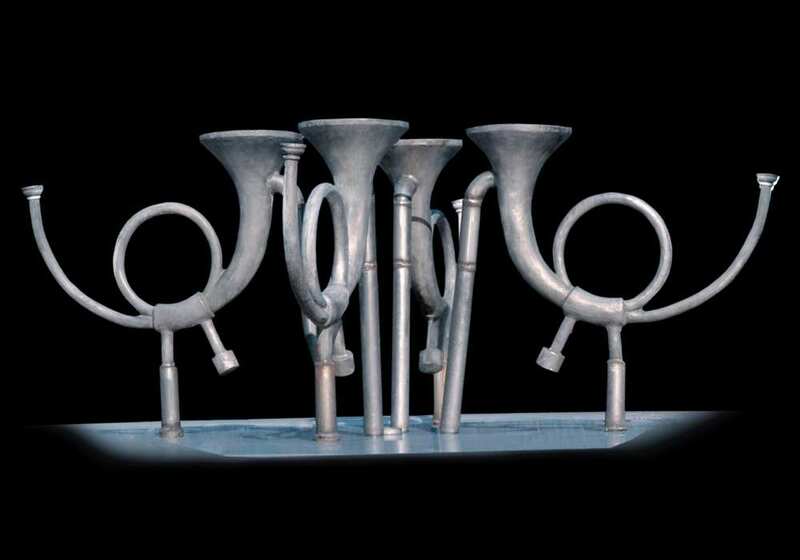 Subsequently, casting was carried out in the investment casting process. 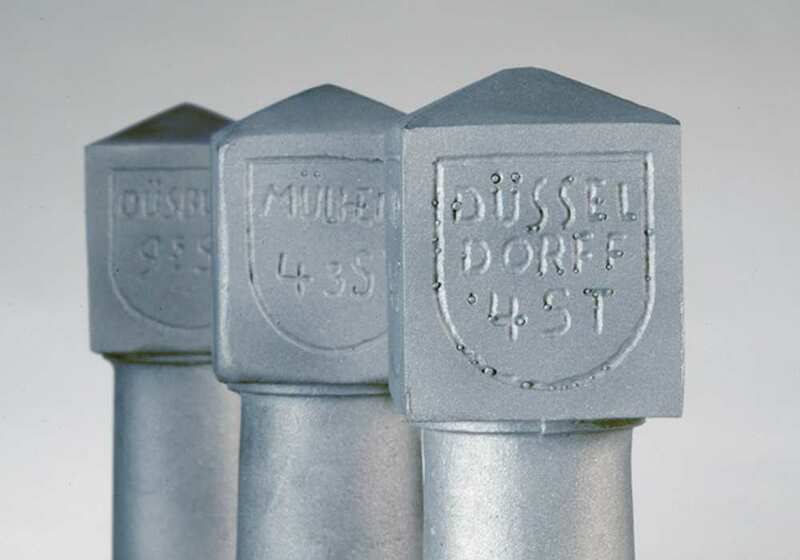 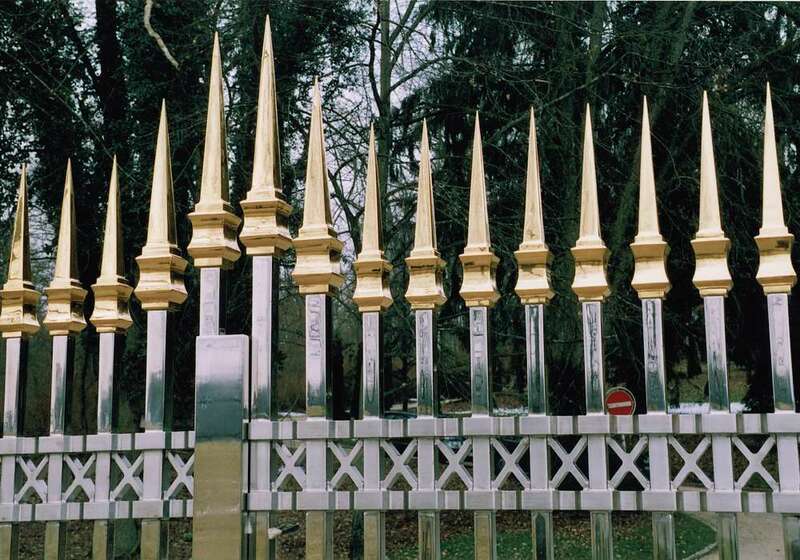 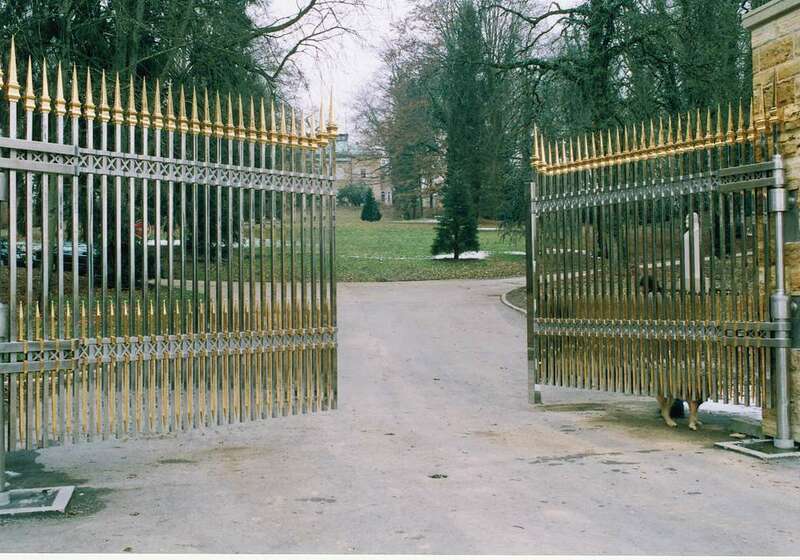 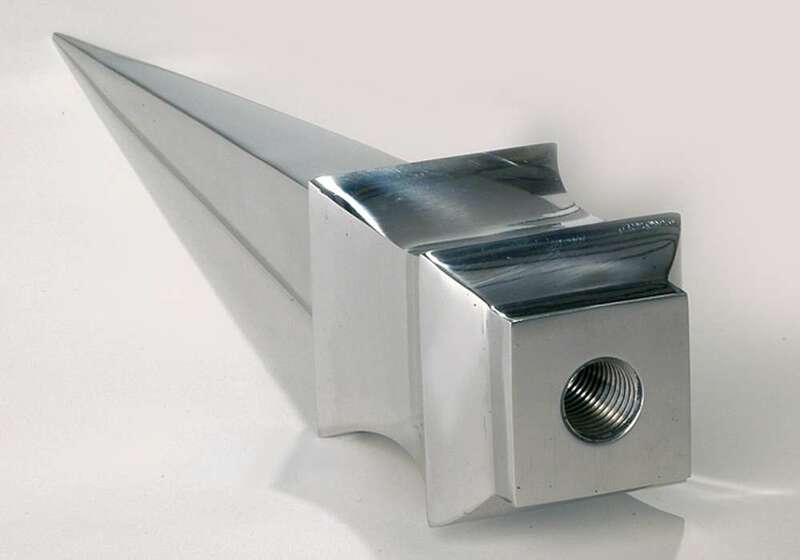 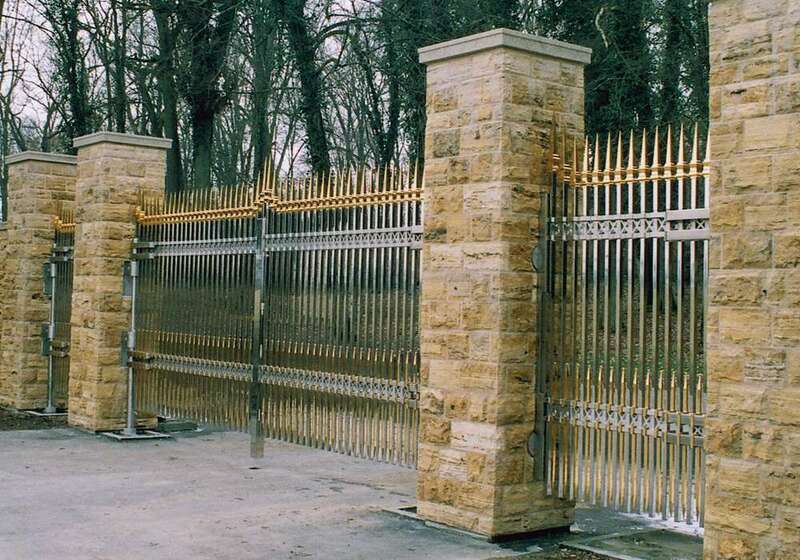 The shapely fence tips for the fencing of a castle in southern Germany are castings made of stainless steel. 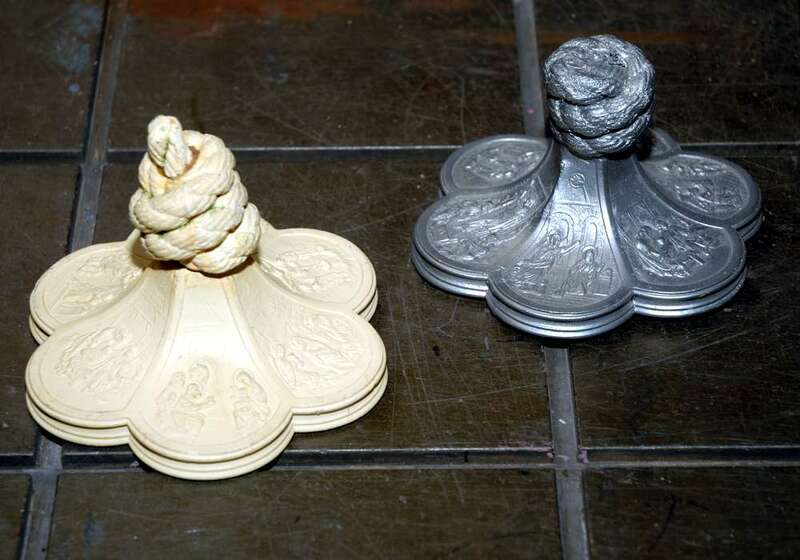 118 pieces were produced through a ceramic molding process and then gold plated. 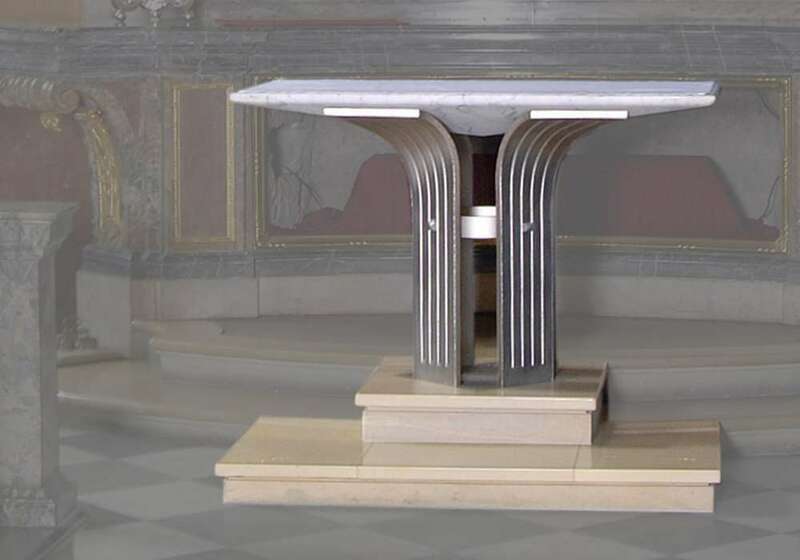 The altar, designed by Dieter Schötzel, in the Kreuzkapelle of the Catholic court church in Dresden appears light and simple. 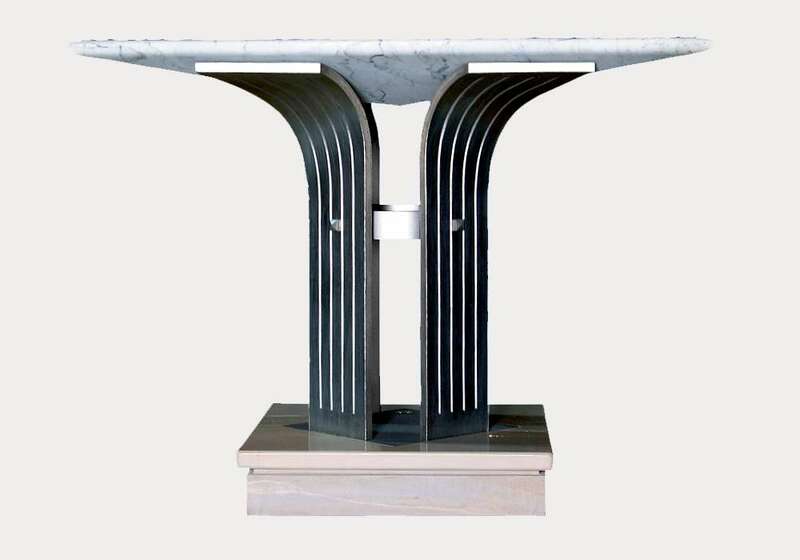 Like an opening petal, the curved construction of 160 kilo chromium-nickel steel carries the heavy marble slab of the celebratory altar. 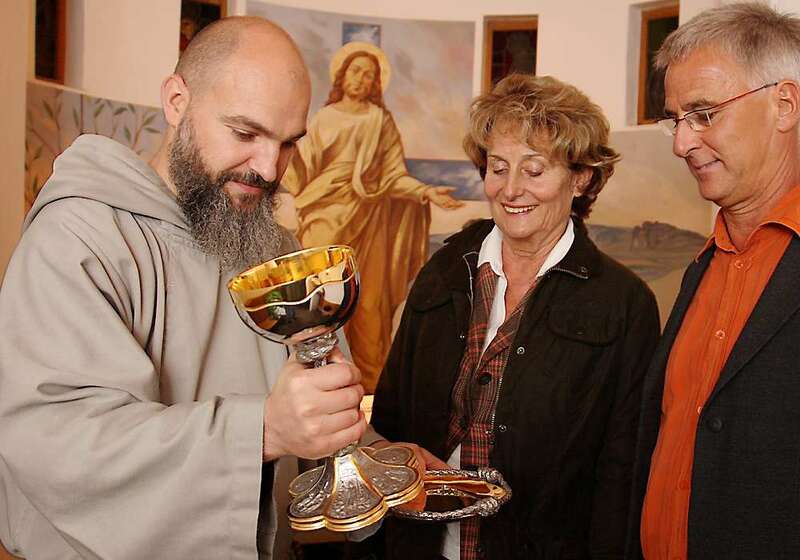 According to the design of the Franciscan monk, Father Paul, who came from Pirna, this chalice was made at SCHMEES. 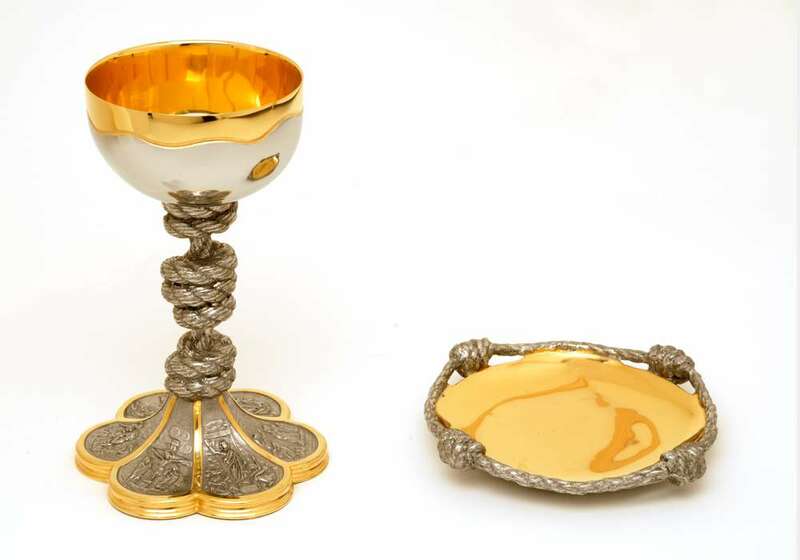 The priest followed an old tradition of the Franciscan Order, according to which each priest has his own cup. 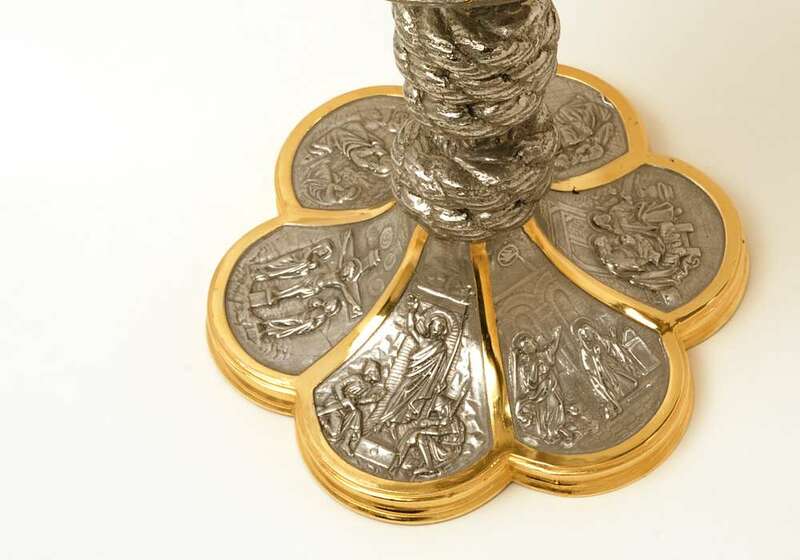 Please note the three knots in the foot of the chalice, a symbol of the vows of the Franciscan Brothers of poverty, unmarried chastity and obedience, as well as the gold-plated surfaces. 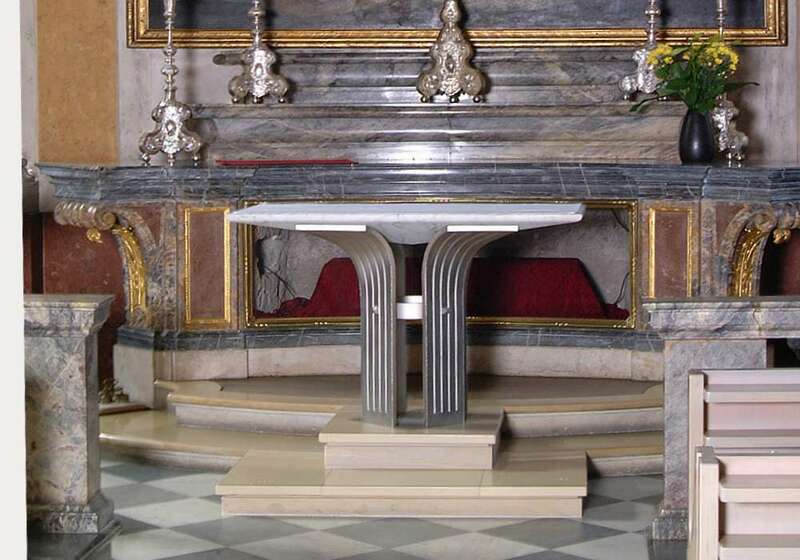 Contact surfaces of wine and altar bread. 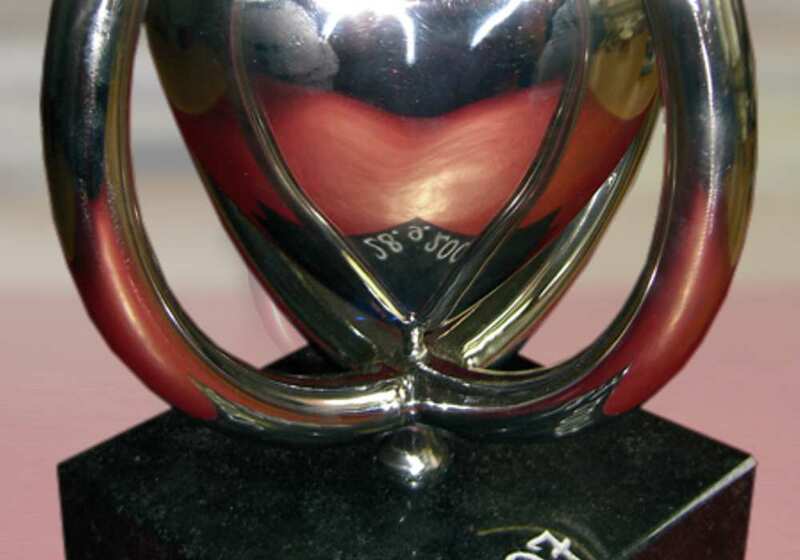 20 years old, but beloved and very comfortable. 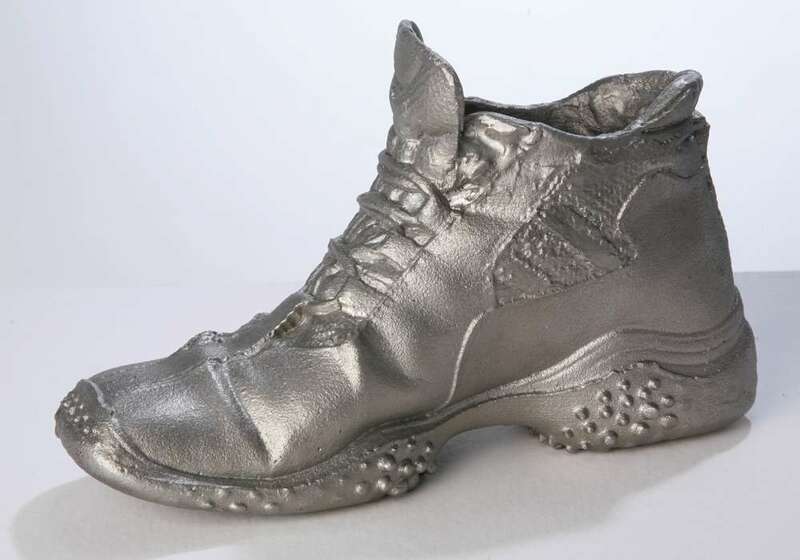 On many walks these shoes have accompanied the wife of an employee of the company Schmees. 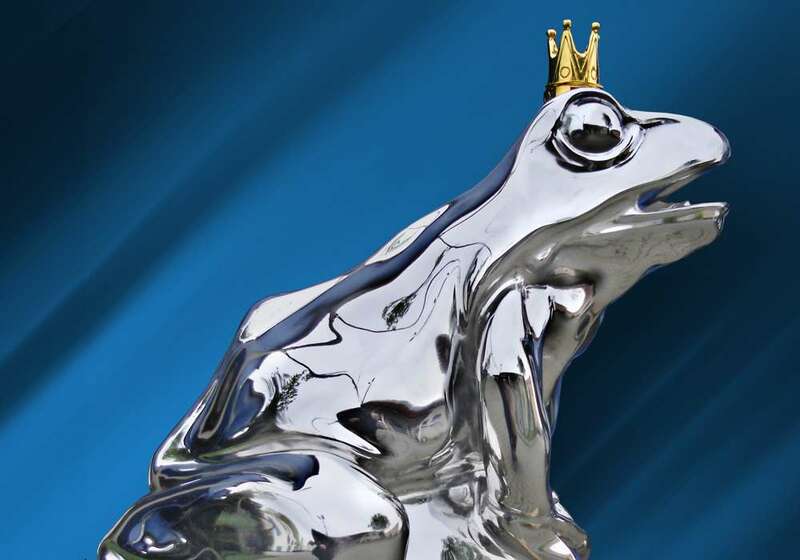 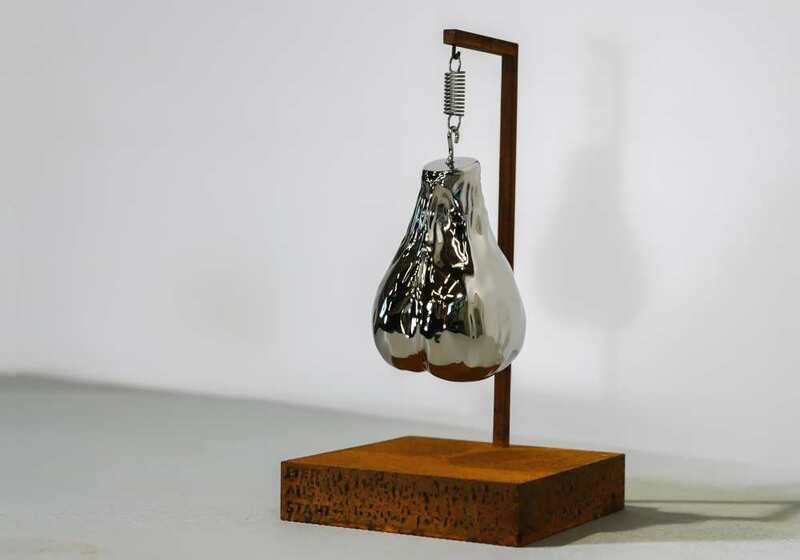 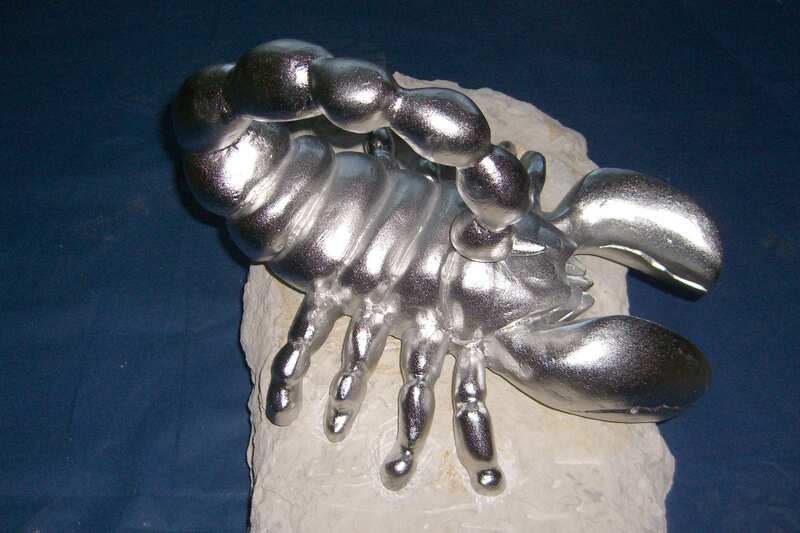 On the occasion of her 50th birthday, he had them immortalized in stainless steel. 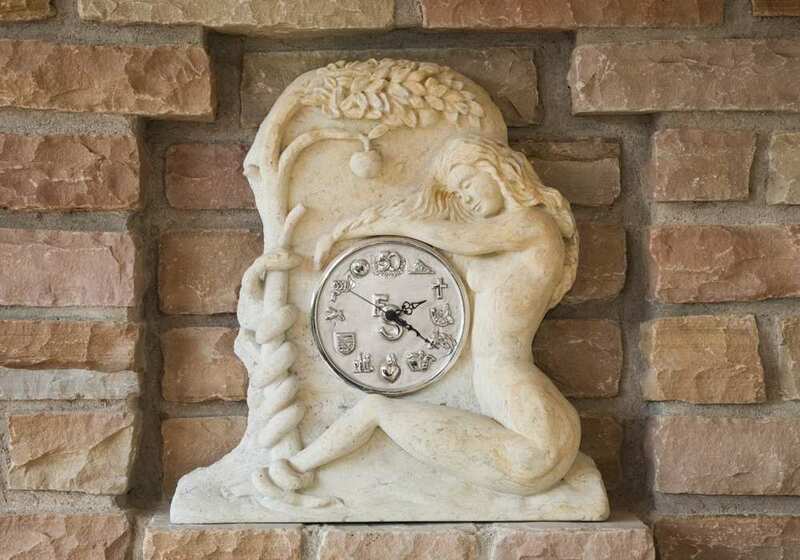 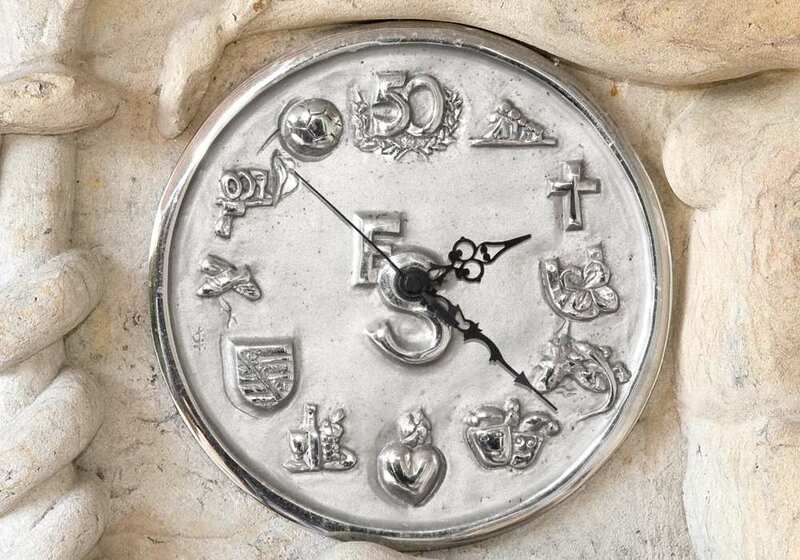 The 12 different symbols on the face of the clock represent the hobbies of Clemens Schmees, for whom this wall clock was made for his 50th birthday. 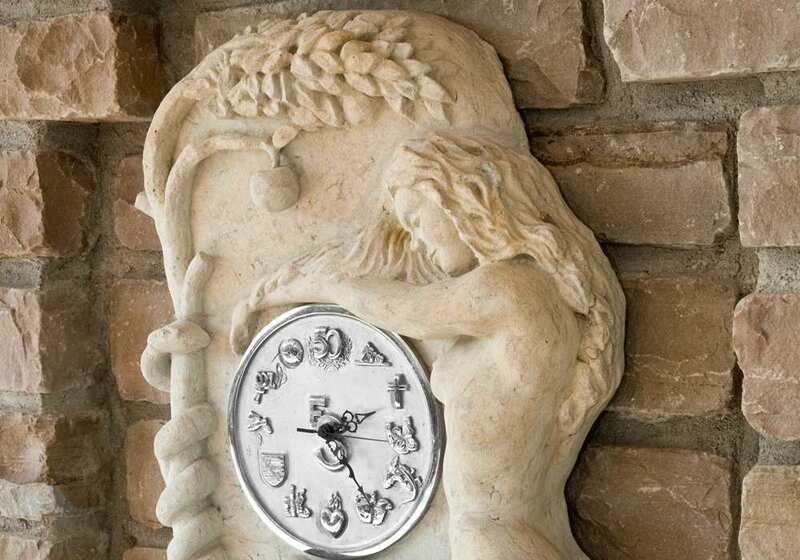 A stonemason from the Elbe Sandstone Mountains first made a plaster model for the face of the clock, which was then molded in wax casting. 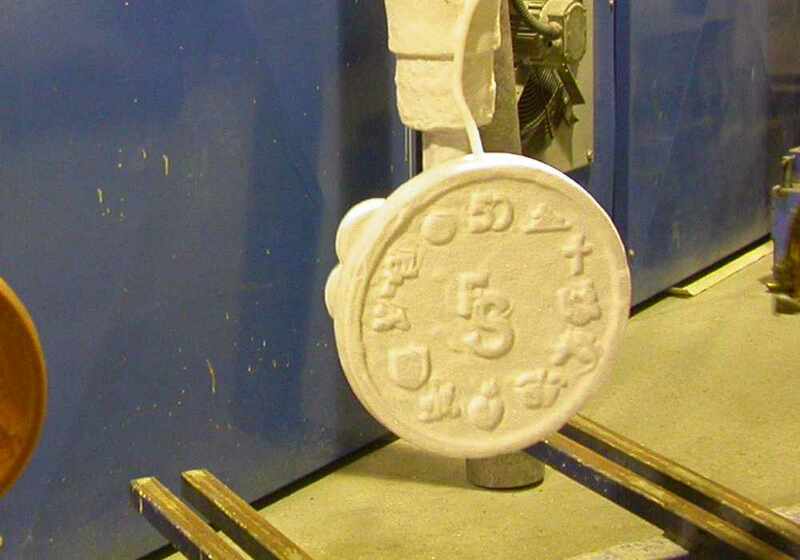 Subsequently, he embedded the steel face plate artistically into a sandstone relief. 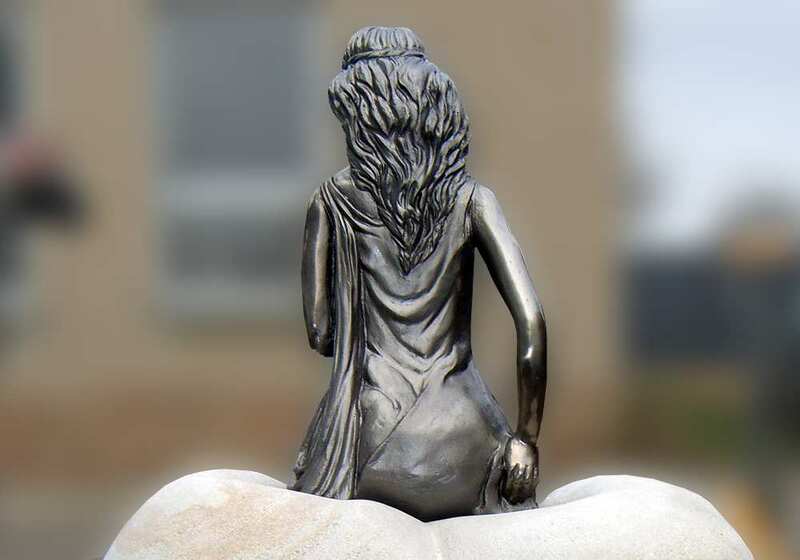 A heartfelt bond for all eternity – this should be expressed with this sculpture. 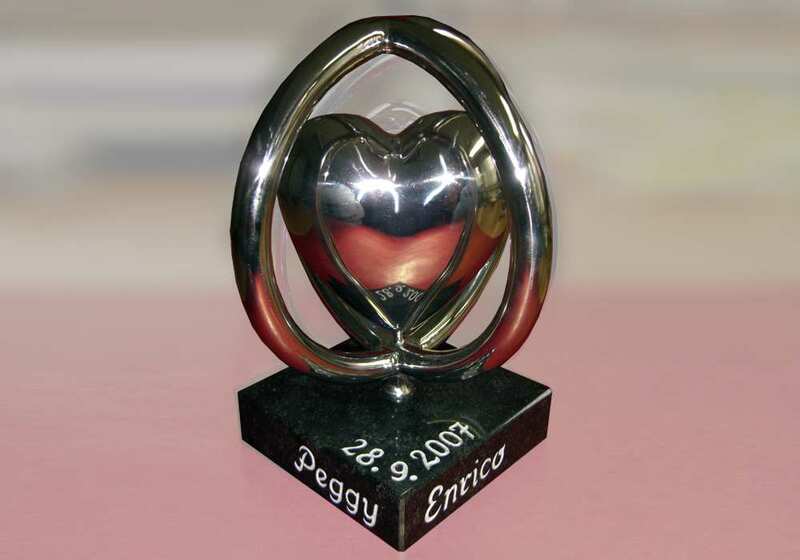 A heart, encased in the symbolism of the wedding rings, was made in stainless steel and placed on a granite base. 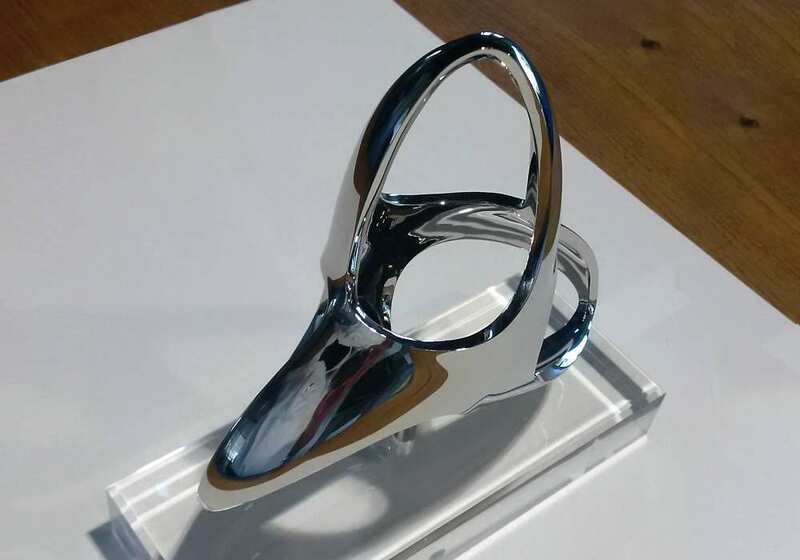 It was ordered as a wedding present. 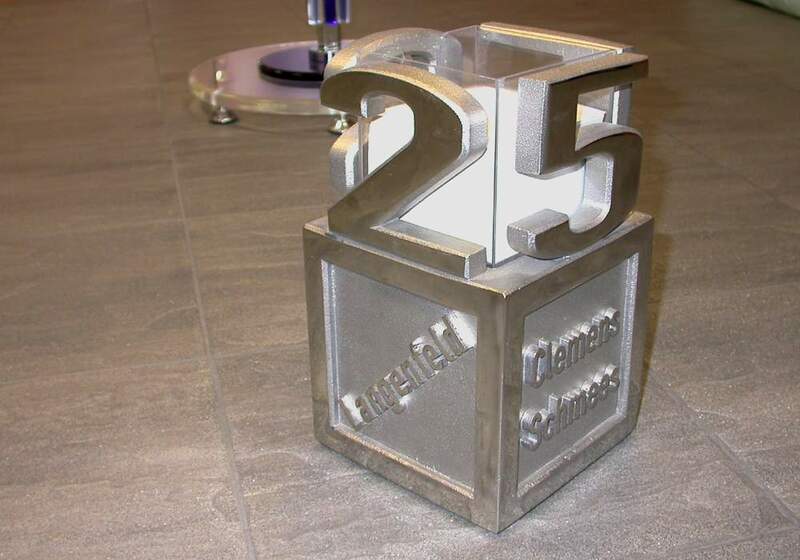 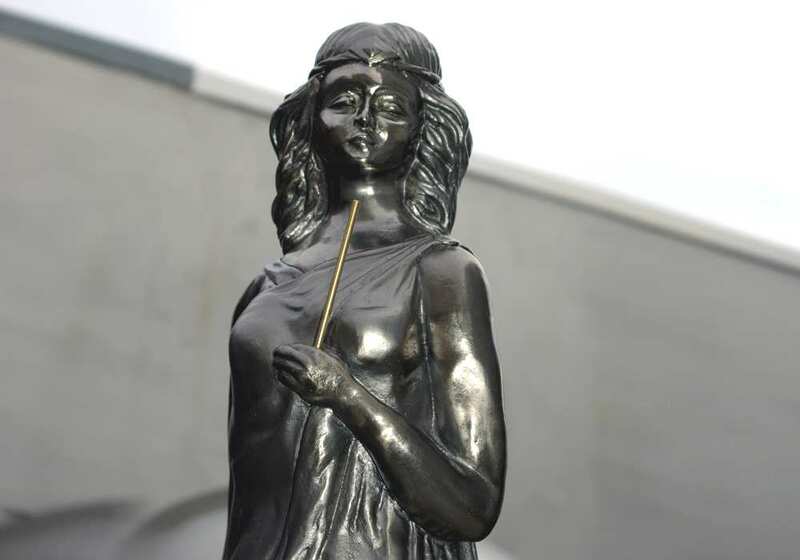 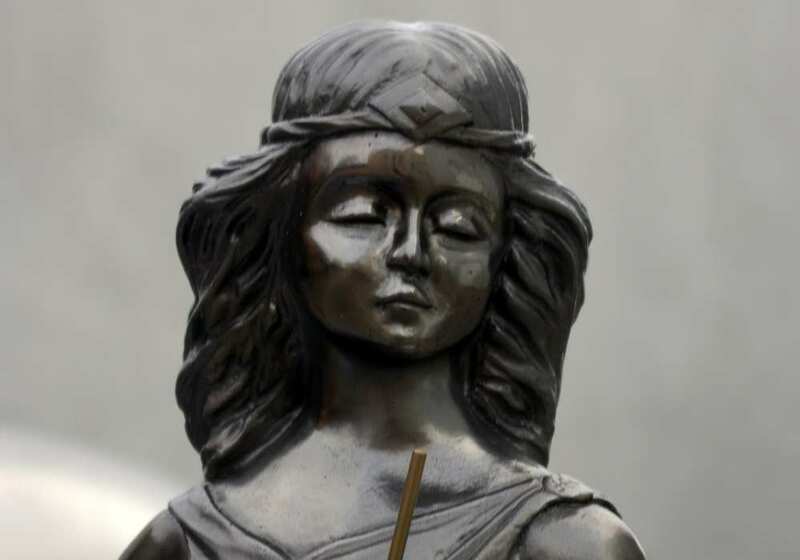 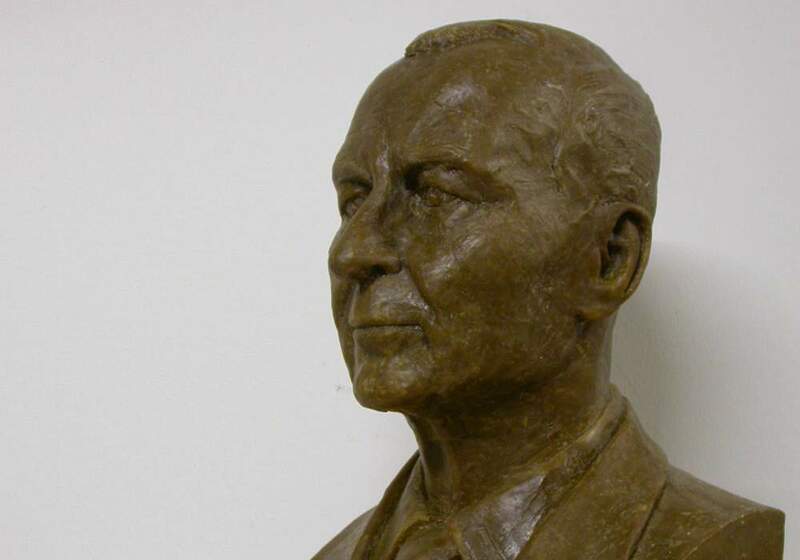 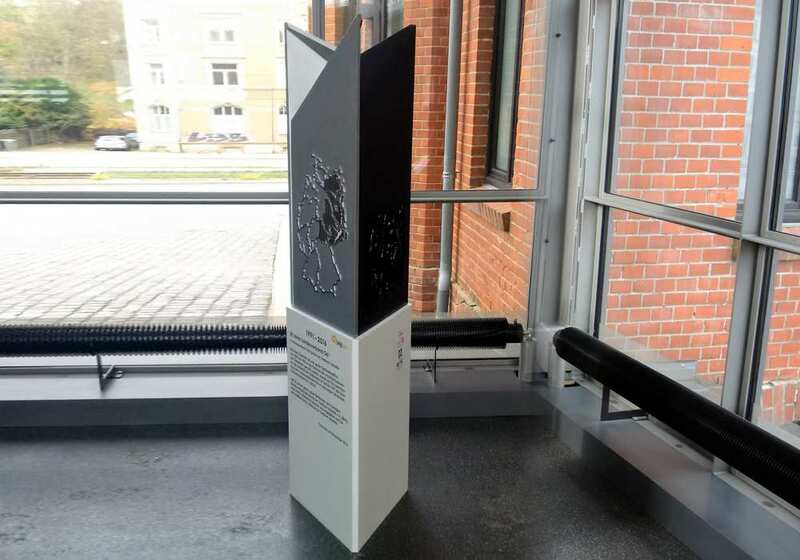 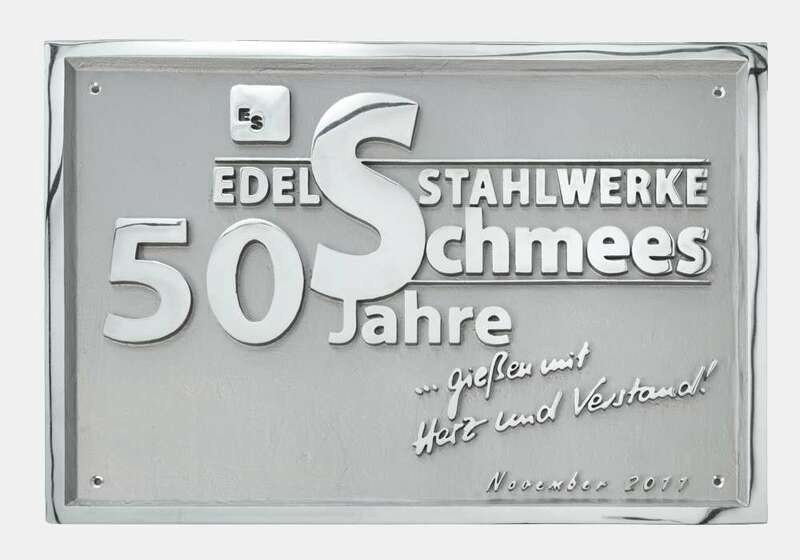 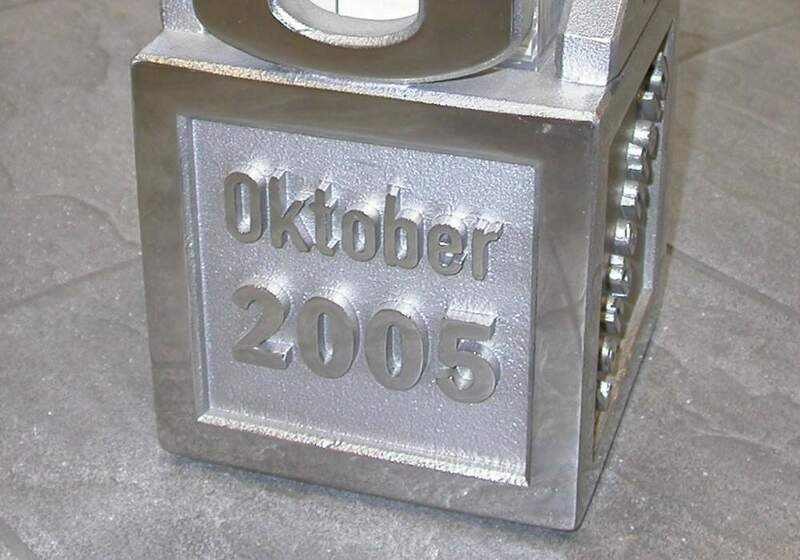 Sigrid Schmees, the founder of the Steelworks, was honored with this sculpture by the company’s employees on the occasion of her 70th birthday. 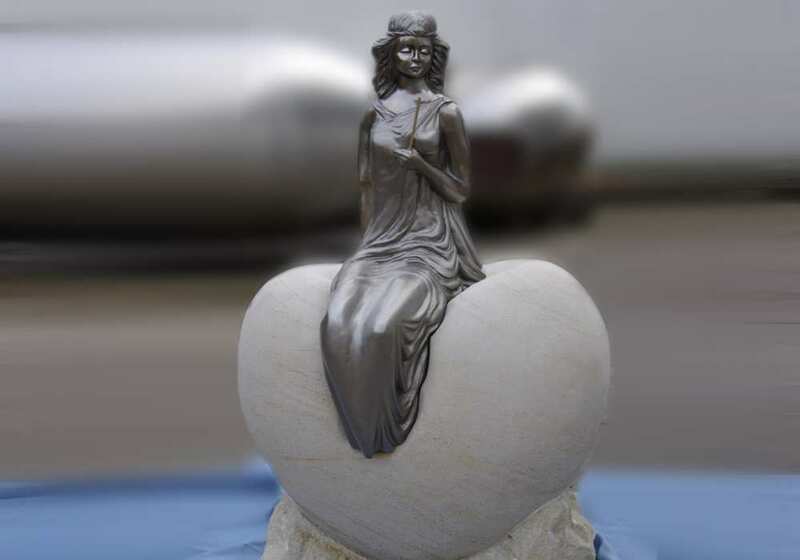 She is always there for you with a great heart! 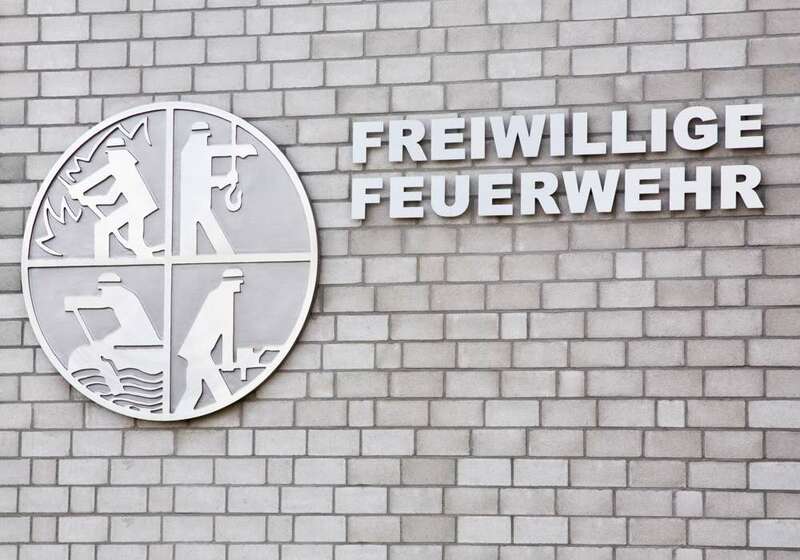 This fire brigade logo was created in 1973 by the Essen artist Bernd Rösel. 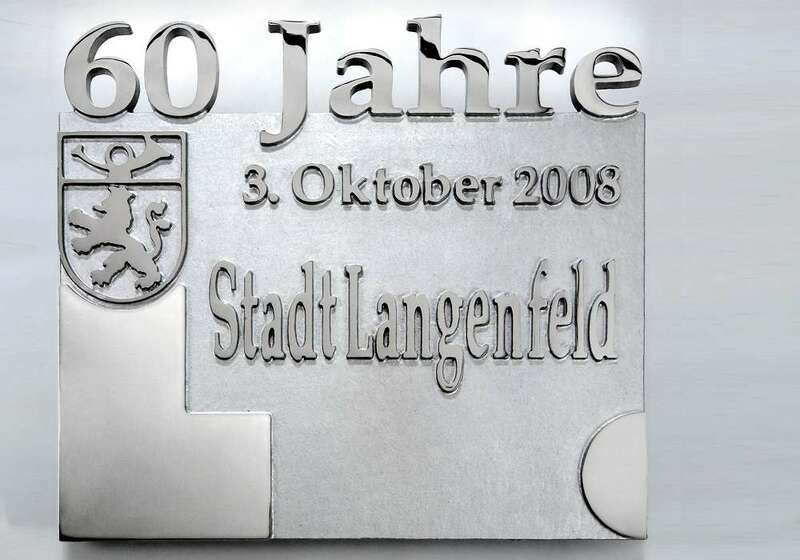 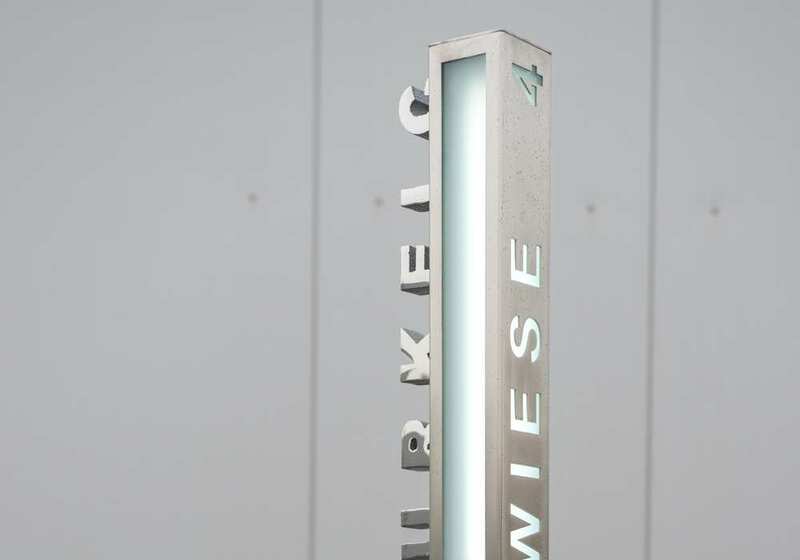 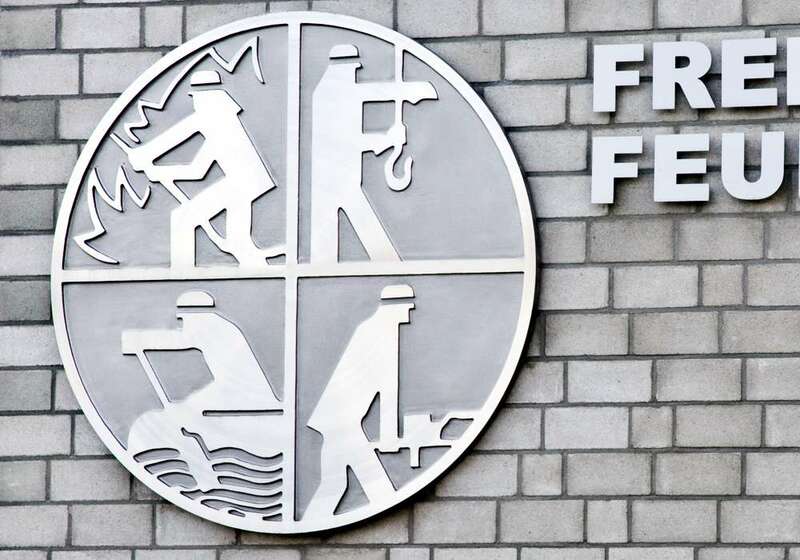 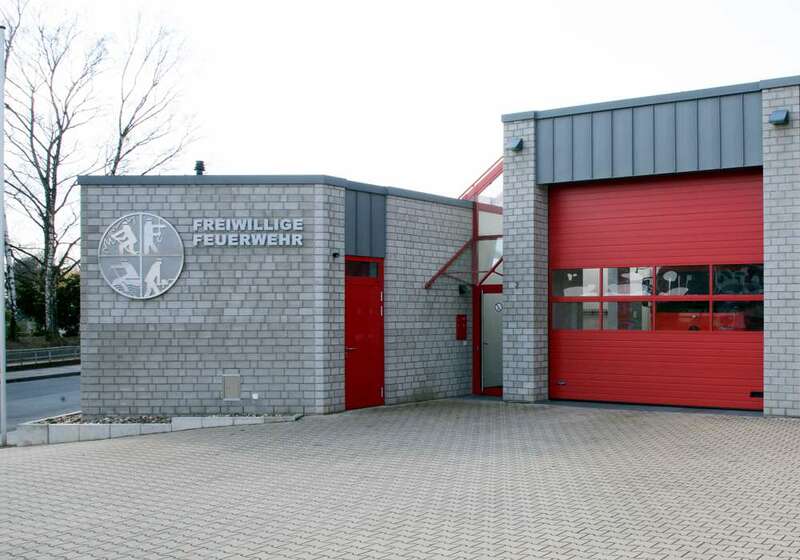 This symbol has been cast in stainless steel for the fire brigade Langenfeld and now adorns the façade there. 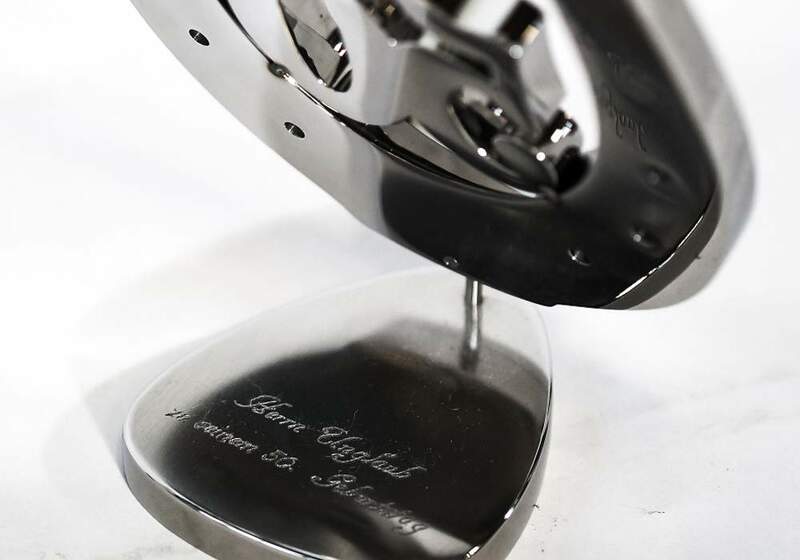 A memorial for eternity: Our experts also make individual commemorative and anniversary plates for your company. 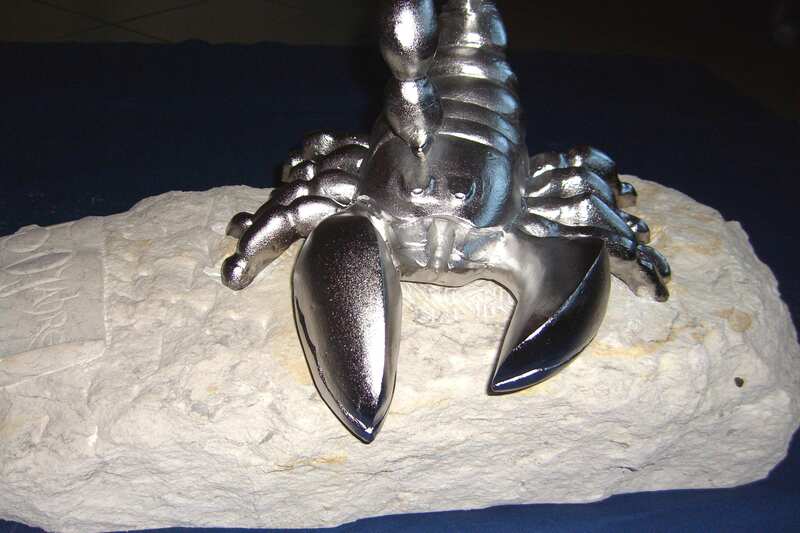 Whether as a gift with a lasting memory or as a special emphasis of your corporate image. 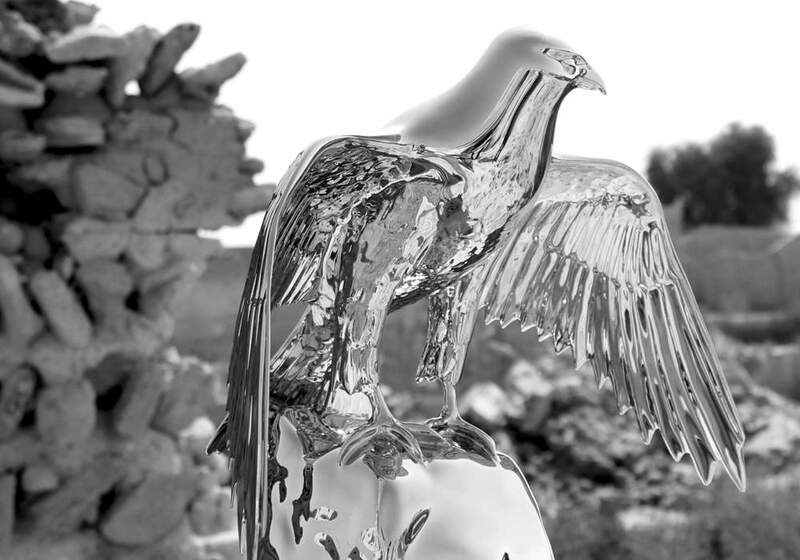 We support you with the implementation of your ideas in terms of design and craftsmanship. 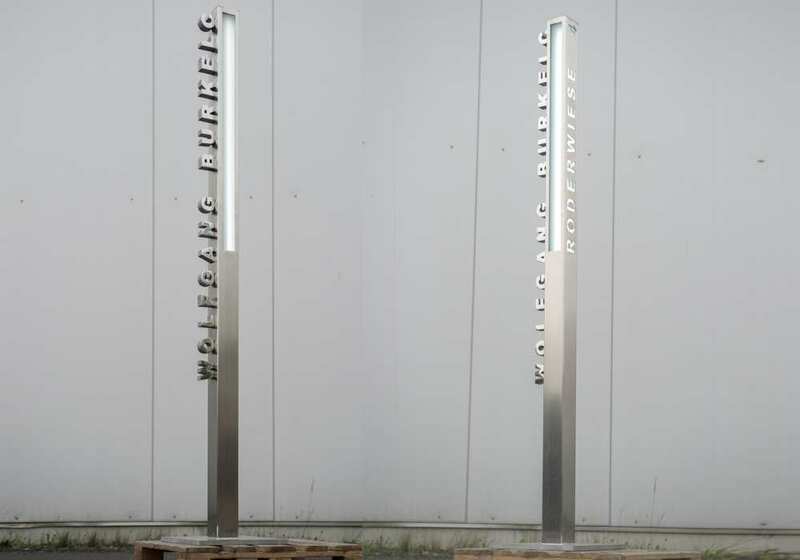 Whether as a logo variation, signpost in your lobby, art in the public area, as an anniversary symbol or as a modern figurehead of your private or business premises. 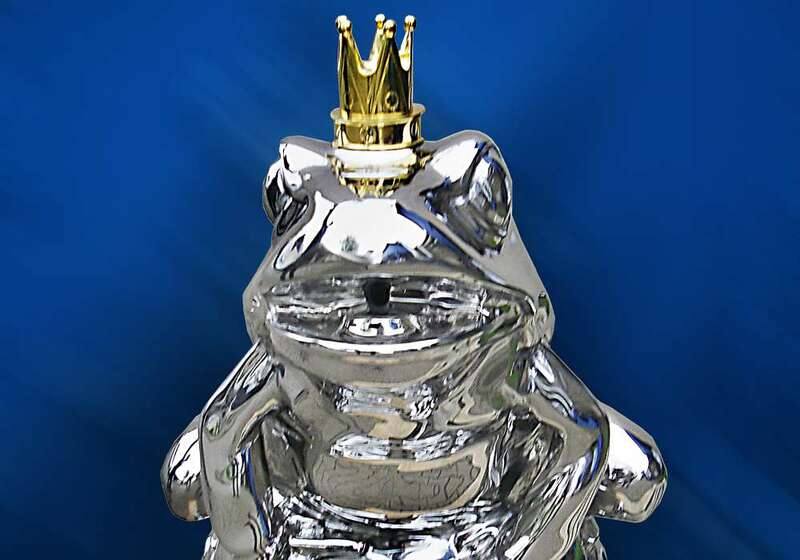 Challenge us! 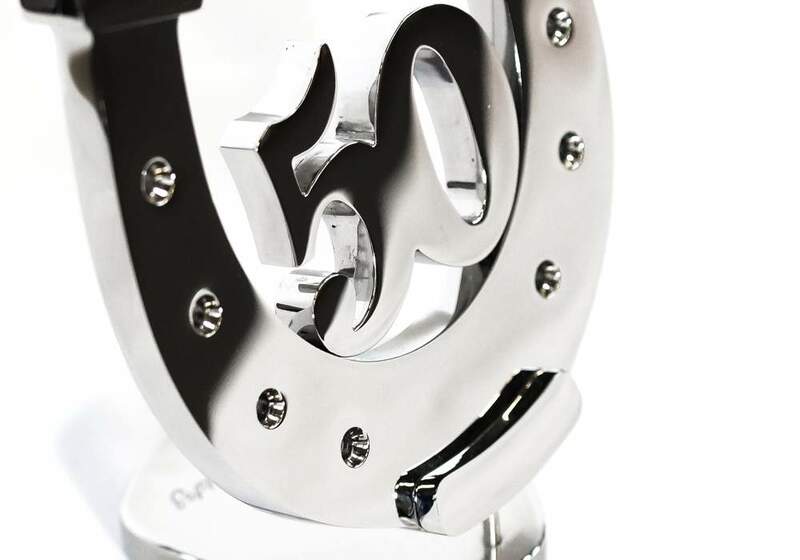 We look forward to your ideas! 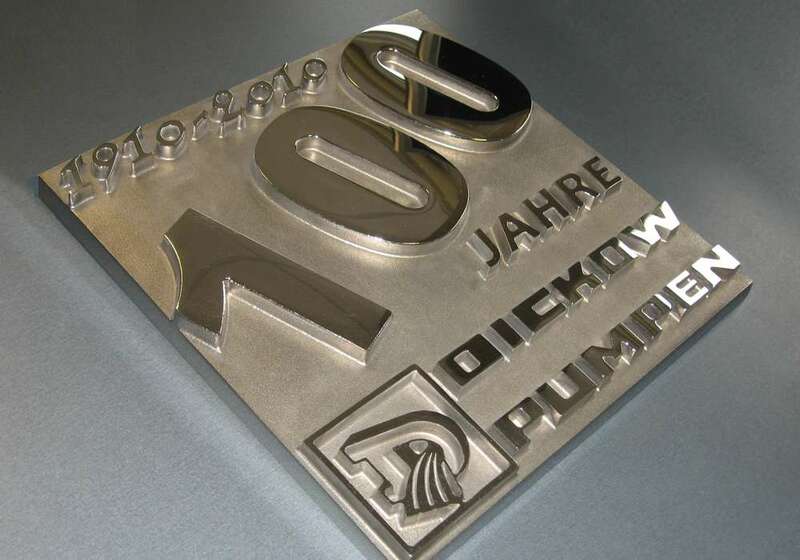 This logo was cast three-dimensionally for the first time. 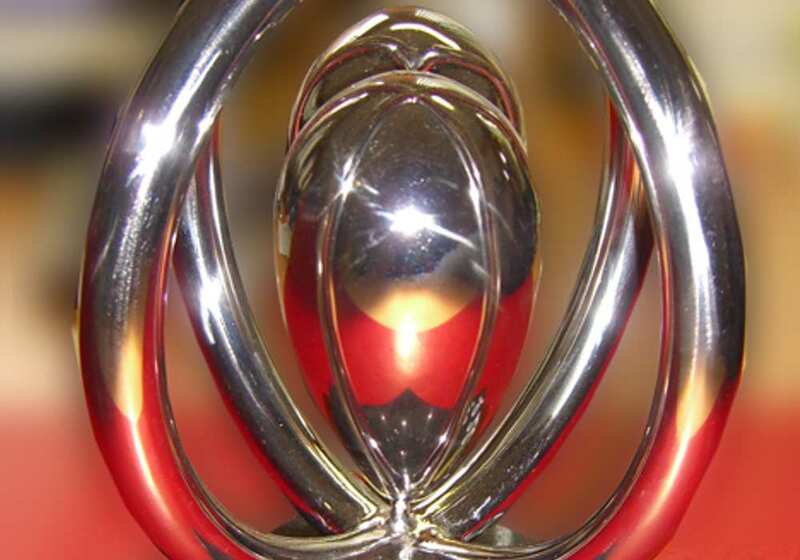 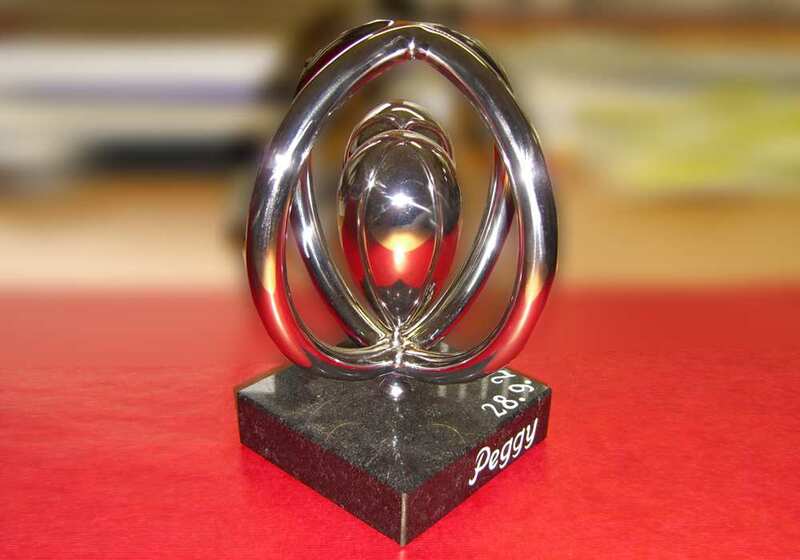 As an award, it is handed over to special employees or business clients on special occasions. 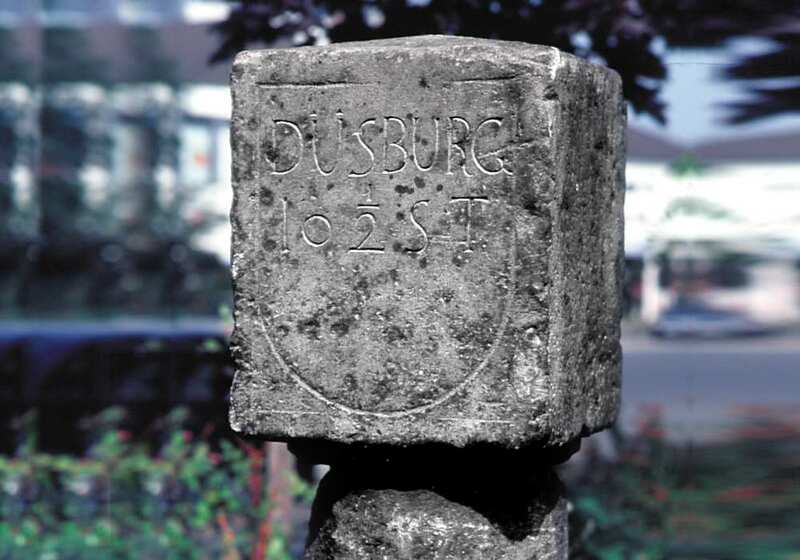 An important symbol and identification of each city is the city coat of arms. 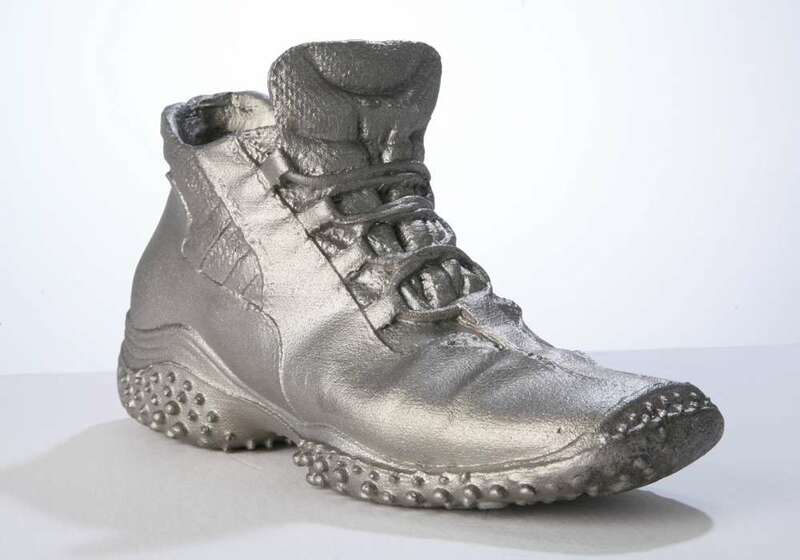 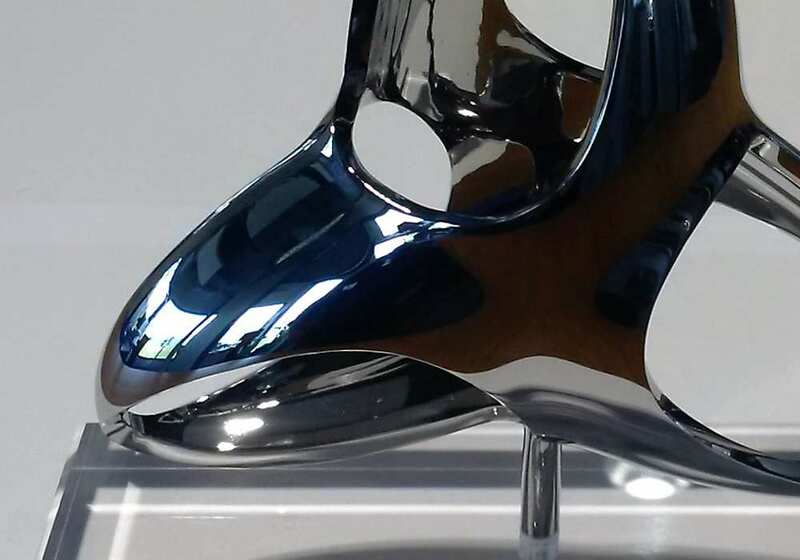 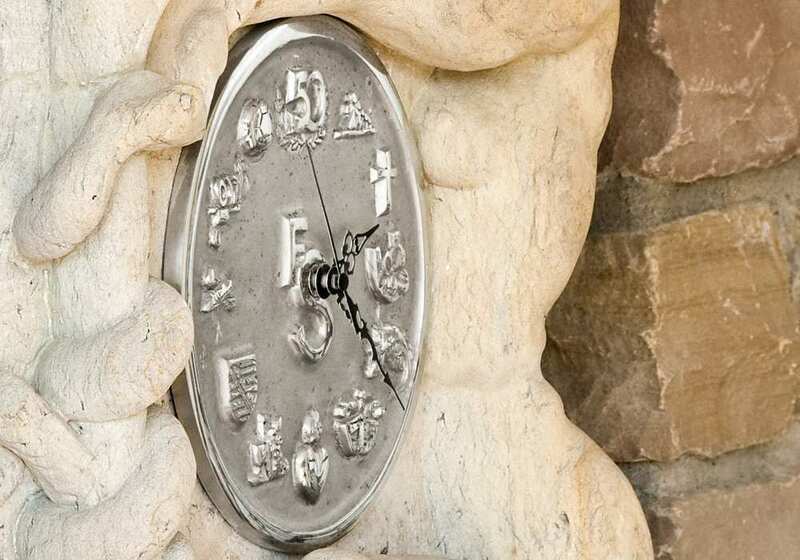 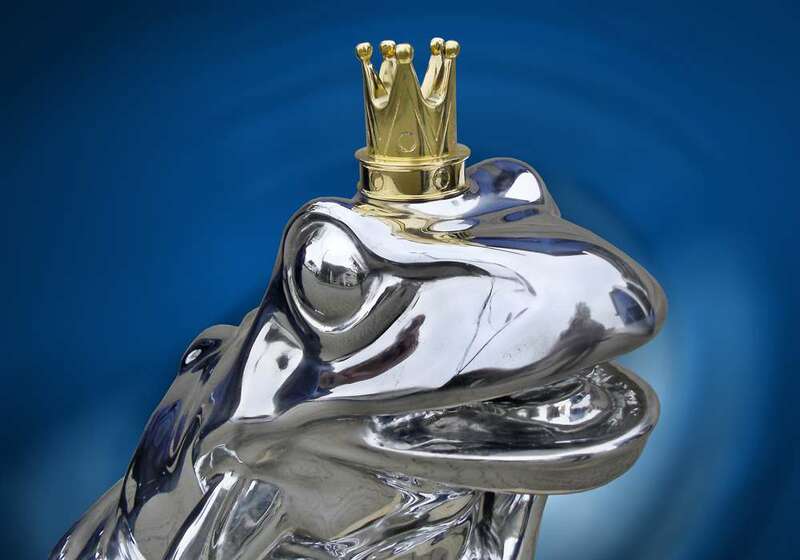 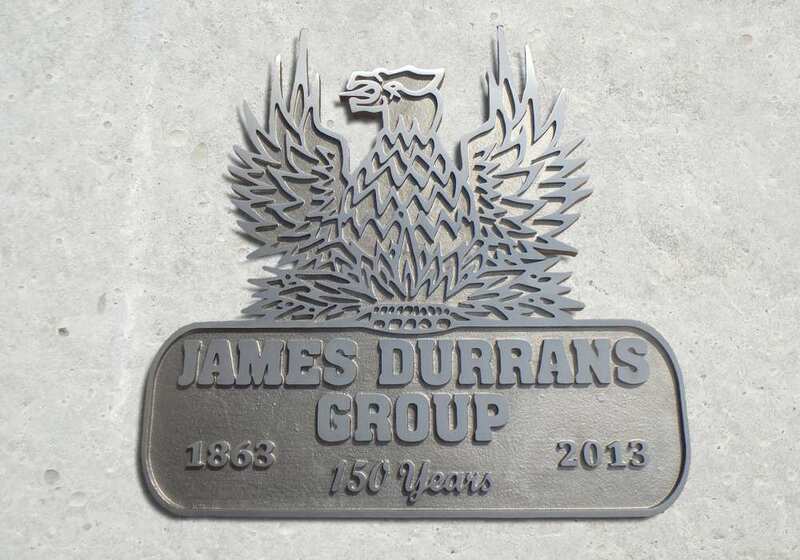 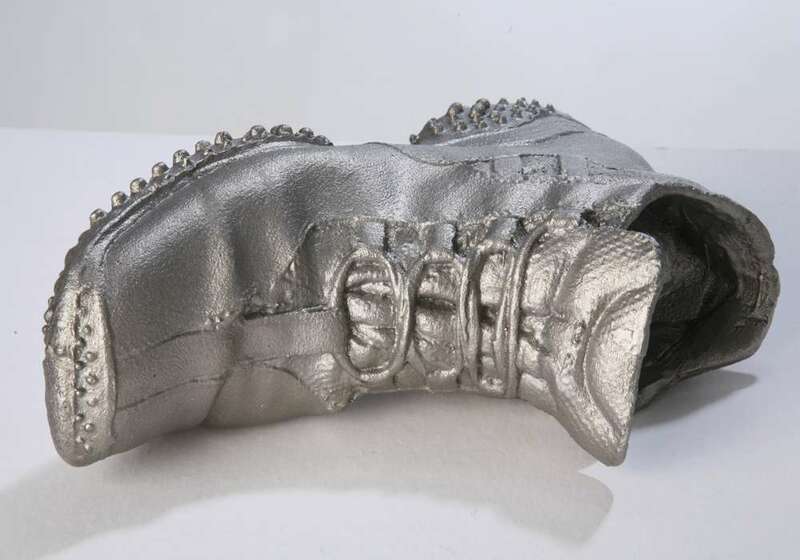 Casts in stainless steel and polished at the relief, is a high-quality marketing tool. 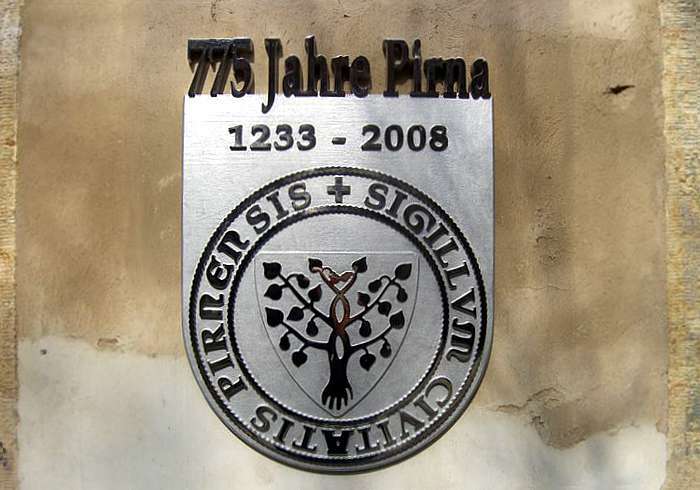 We will also gladly assist you with the implementation of your family coat of arms. 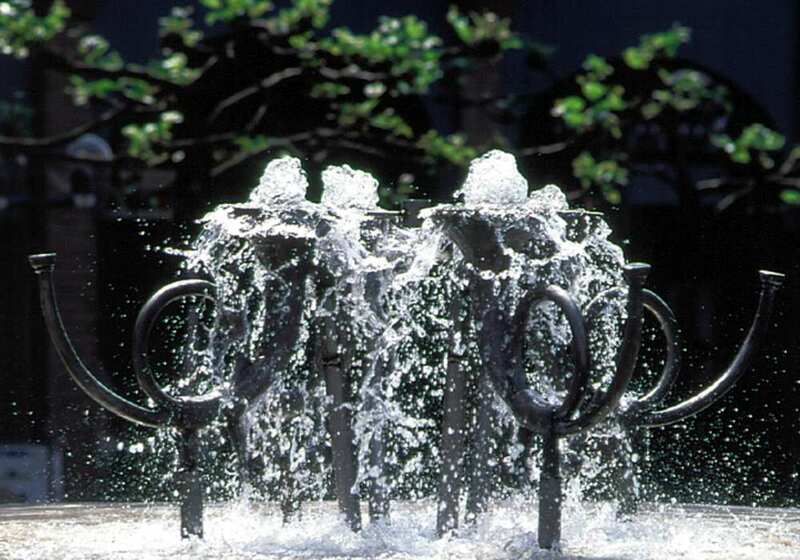 The post-horns decorate the well in front of the town hall of Langenfeld and represent symbolically the proximity to various transport routes of the city of Langenfeld, which already served in 1668 as a major crossroad for post coaches and post riders. 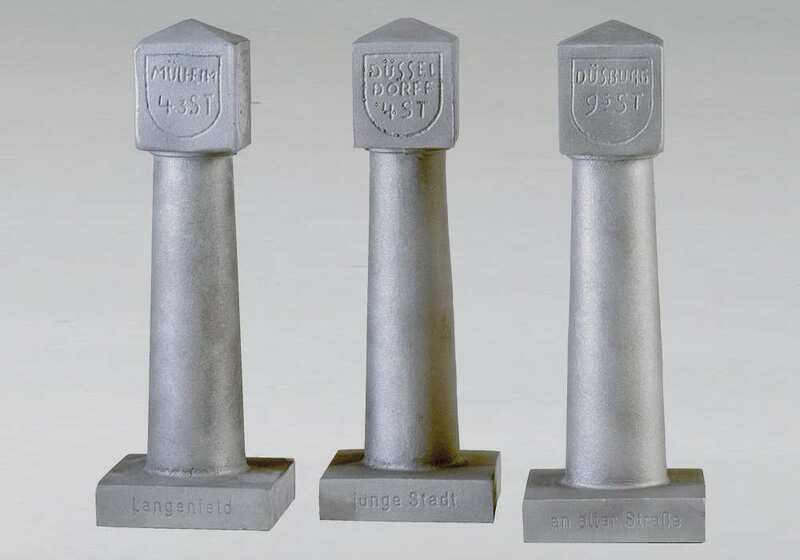 They were made at the initiative of the former city councilor Heinz-Gerd Karhausen. 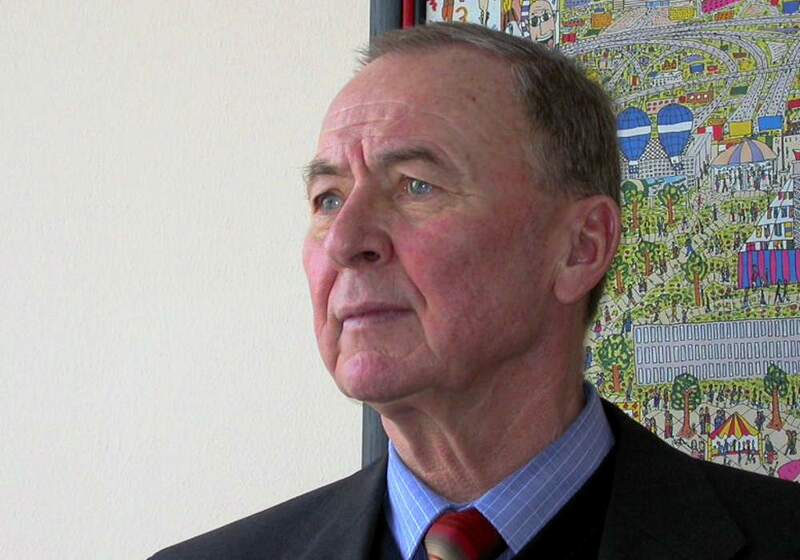 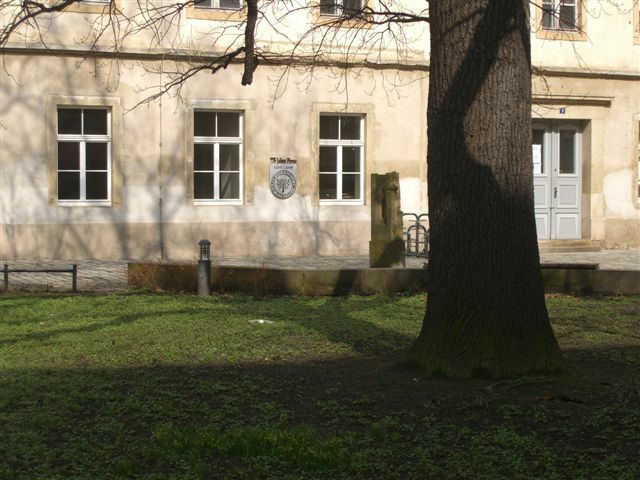 Since 2010, the International Schostakowitsch Days Gohrisch have been held in close cooperation with the Dresden State Capitol Dresden every year for three days. 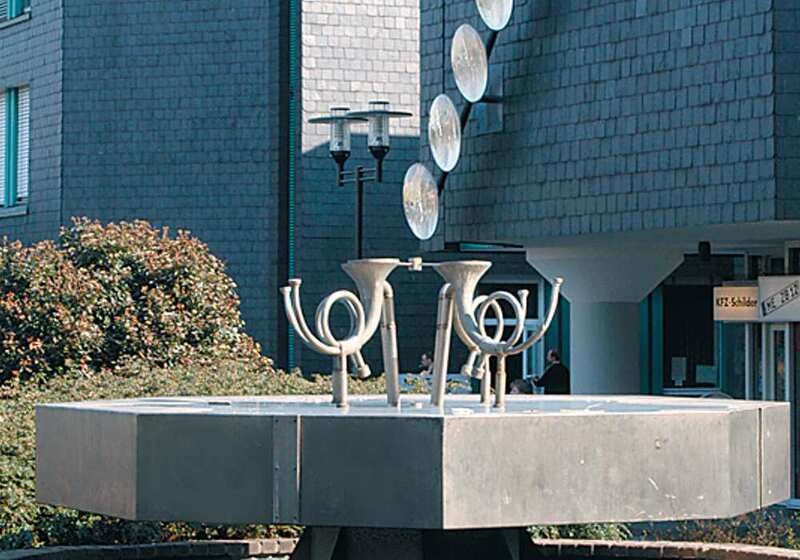 Dmitri Shostakovich (1906-1975) composed his famous eight string quartet in the health resort in 1960. 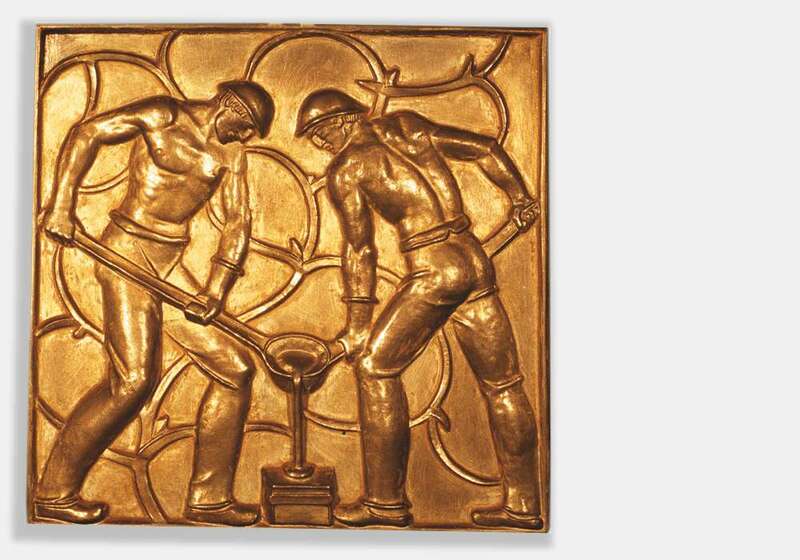 His works reflect the difficult living conditions in the former Soviet Union. 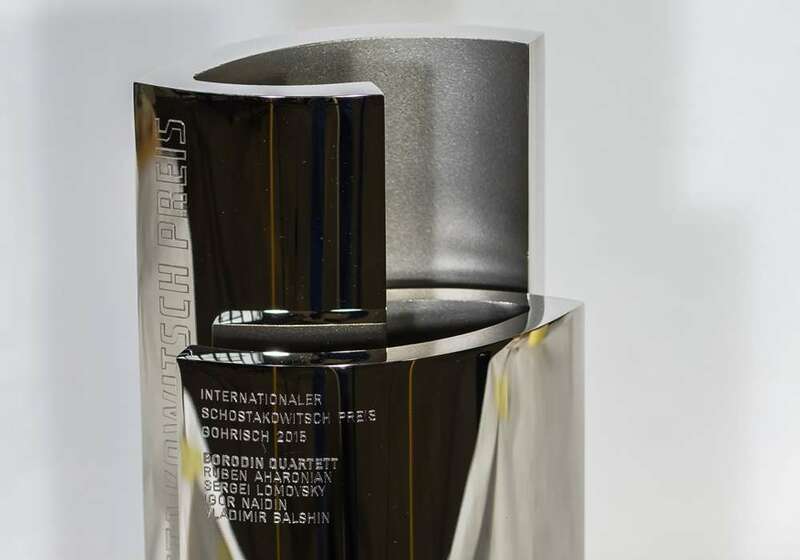 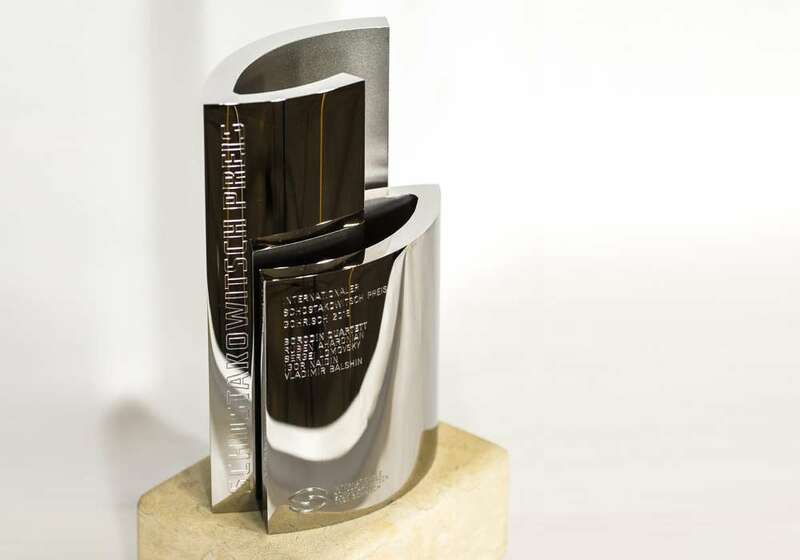 Every year, personalities are honored with the International Shostakovich Prize, Gohrisch, who have made a special contribution to Shostakovich’s work. 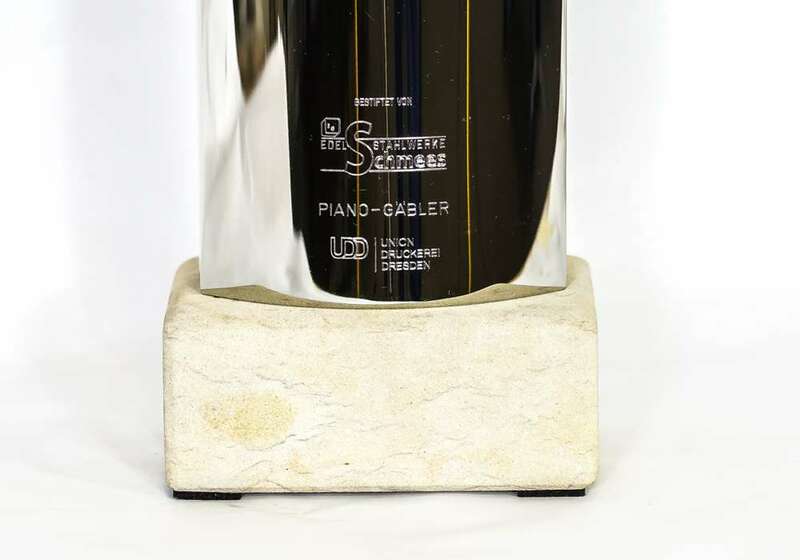 Viewed from above, the two polished stainless-steel elements on a neutral base resemble the Shostakovich logo. 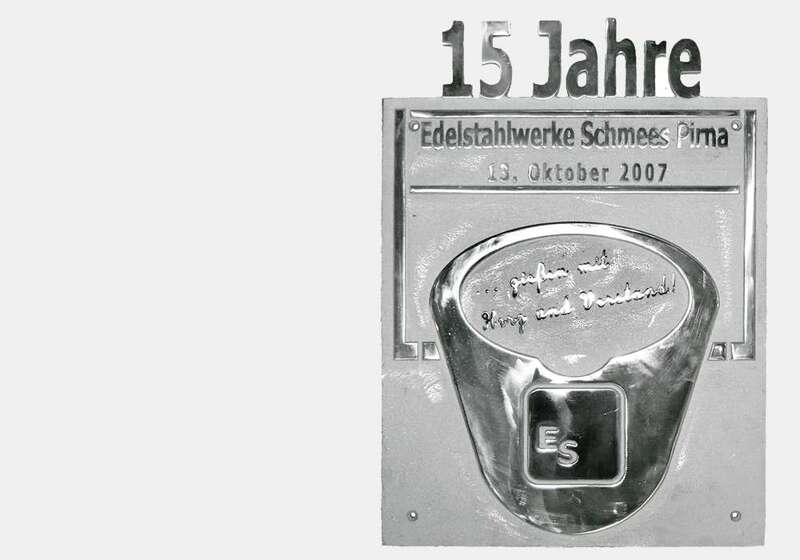 Even today you can find the historic milestone as a waypoint for travelers at the motorway 8 in Langenfeld. 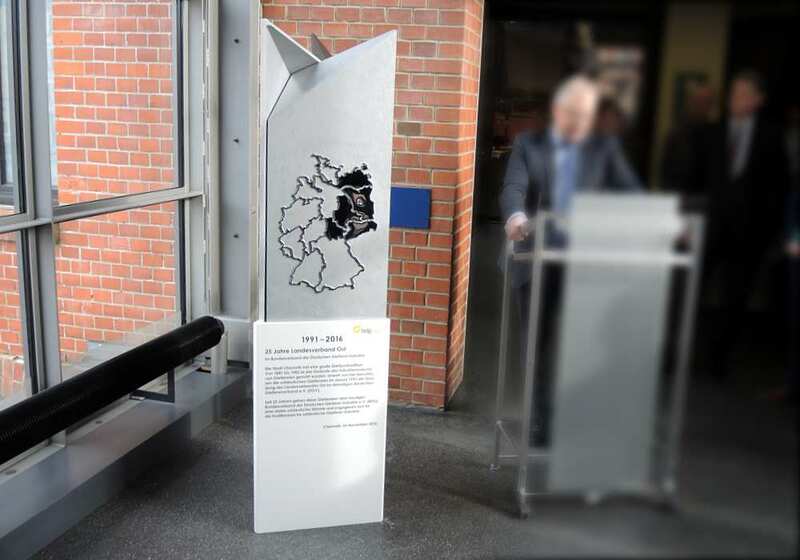 It showed the distances on the postal routes in hours. 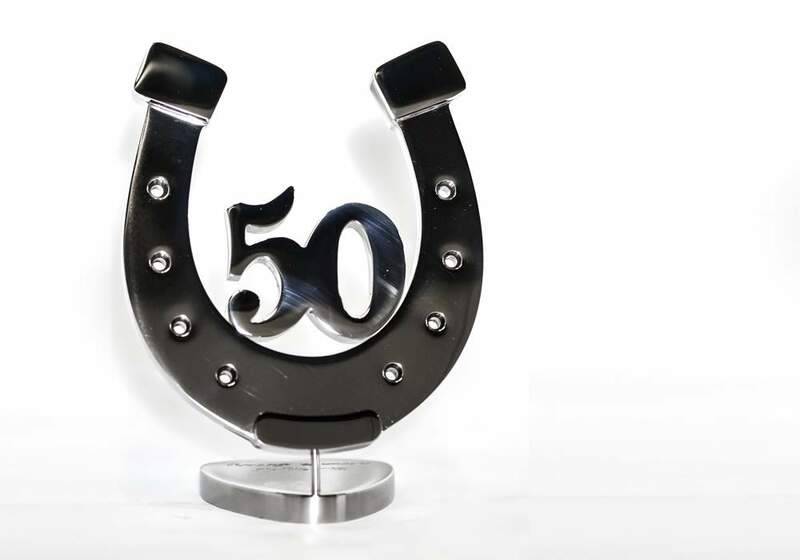 A miniature edition of this milestone is given away today by the mayor on special occasions. 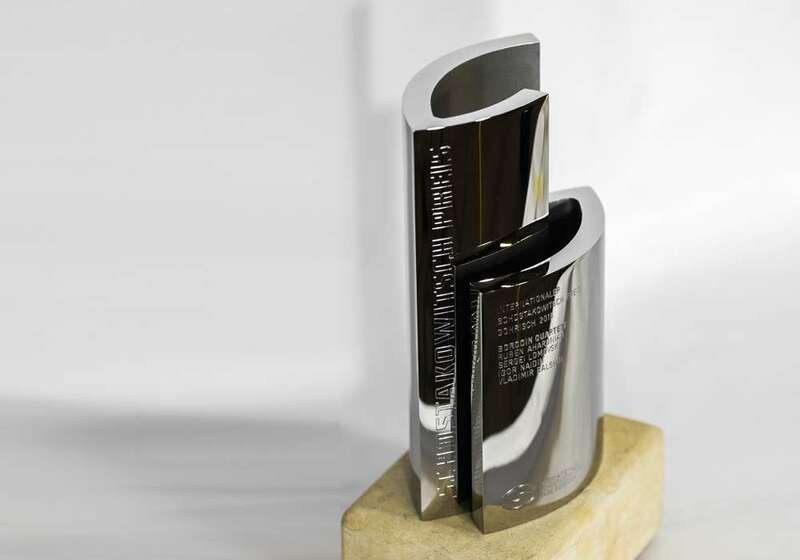 With the golden version, the industry association honors the entrepreneur of the year every two years. 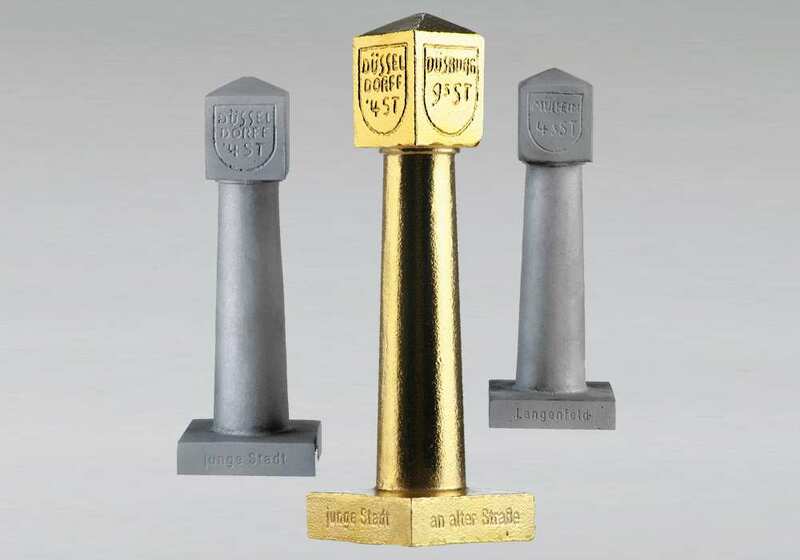 “Anyone who wants to be successful in this world got to have balls.” Award for business partners of a smoothie manufacturer. 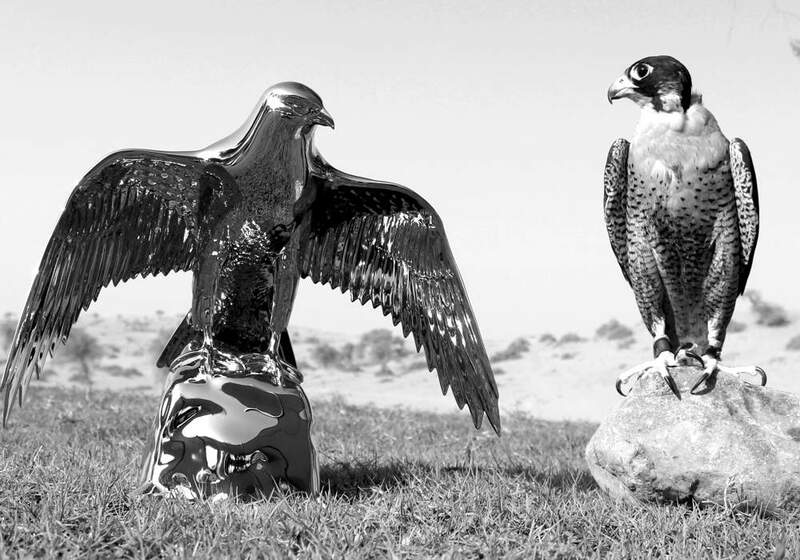 This falcon is an exclusive product of SCHMEES art from the PRIDE line. 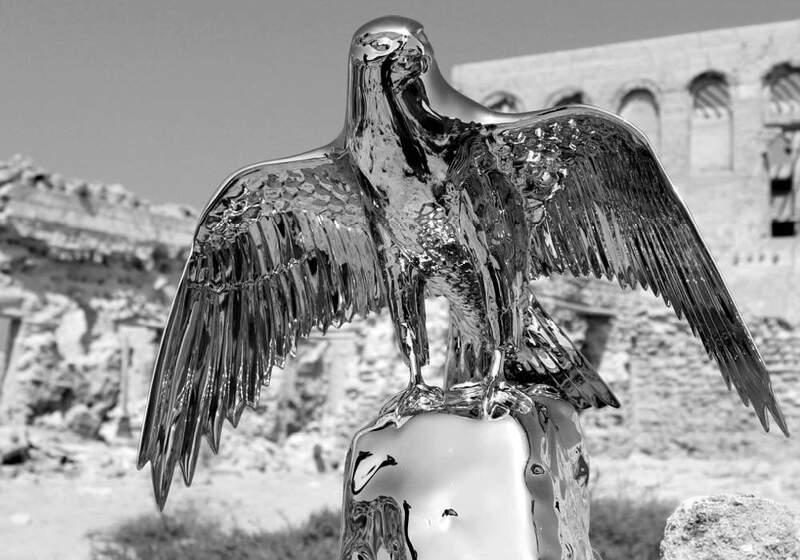 In a worldwide unique process a noble, true to life portrayal of a falcon was created. 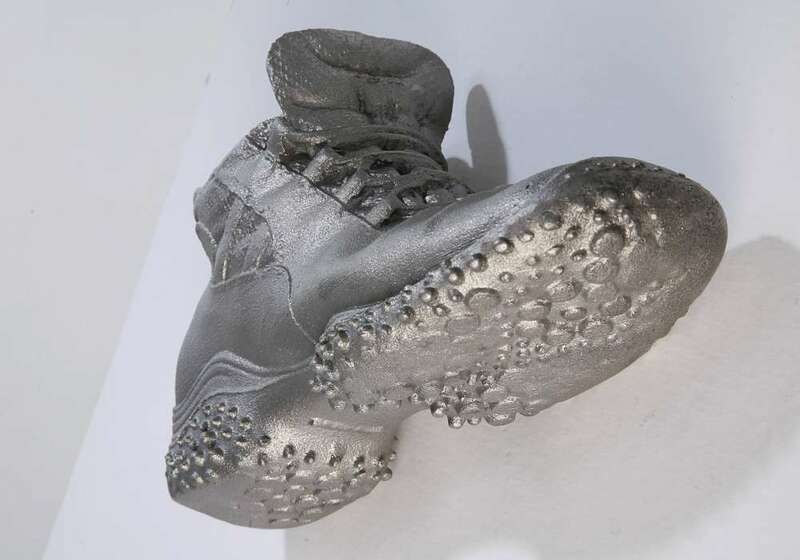 The precious art object emerged step by step in an elaborate process. 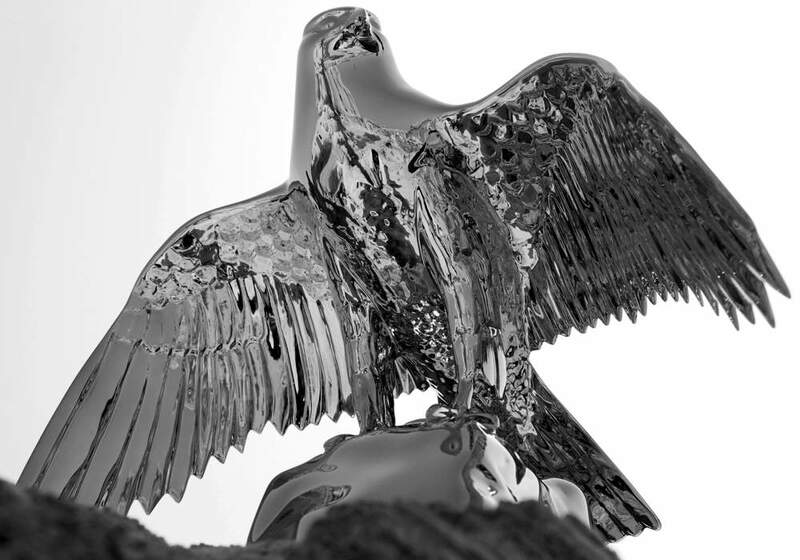 To reflect the majestic appearance of the falcon, an individual 3D model was developed. 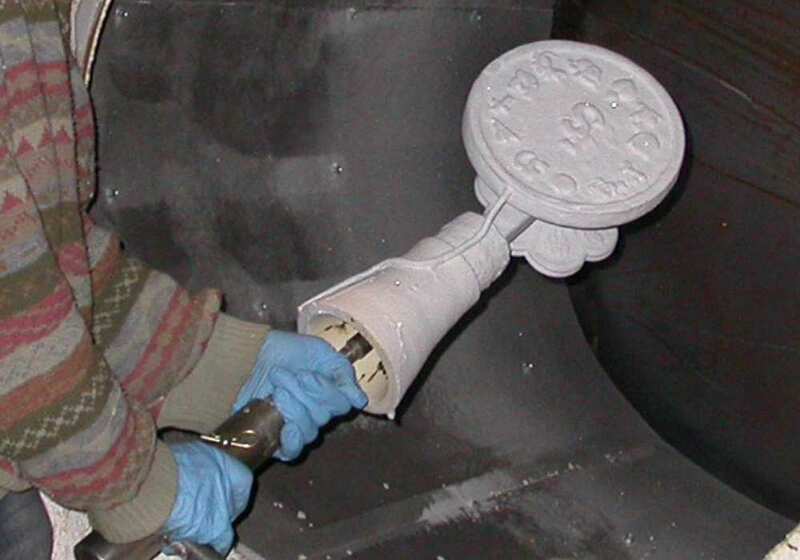 The cast was made with one of the highest quality and hardest materials by a skilled caster with great attention to detail. 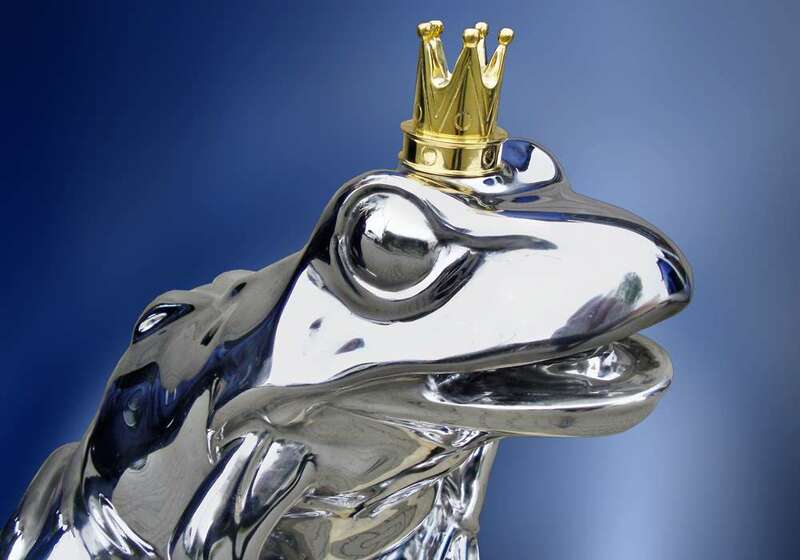 In several hundred hours of handwork, the extraordinary exhibit was then polished to perfection to a high gloss. 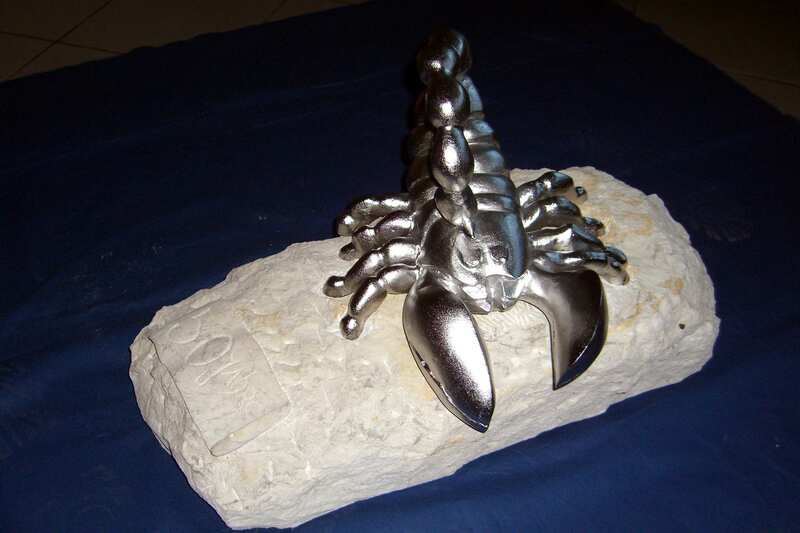 Zodiac Sign was made for the 40th birthday of Mrs. Schmees-Besgen.